See also Norway on Wikipedia; the 9th edition; 1922 update; and our 1911 Encyclopædia Britannica disclaimer. NORWAY (Norge), a kingdom of northern Europe, occupying the W. and smaller part of the Scandinavian peninsula. Its E. frontier marches with that of Sweden, except in the extreme N., where Norway is bounded by Russian territory. On the N., W., S. and S.E. the boundary is the sea—the Arctic Ocean, that part of the Atlantic which is called the Norwegian Sea, the North Sea and the Skagerrack successively. The S. extremity of the country is the island of Slettingen in 57° 58' N., and the N. that of Knivskjærodden, off the North Cape in 71° 11' N. Of the mainland, the southernmost promontory is Lindesnæs, in 57° 59' N., while the northernmost is Nordkyn, in 71° 7' N. The S. of the country, that is to say, the projection between the Skagerrack and the North Sea proper, lies in the same latitude as the N. of Scotland and Labrador, and the midland of Kamchatka. The most western island, Utvær, lies off the mouth of the Sogne Fjord (4° 30' E.), and the easternmost point of the country is within the Arctic lands, near Vardö (31° 11' E). The direct length of Norway (S.W. to N.E.) is about 1100 m. The extreme breadth in the S. (about 61° N.) is 270 m., but in the N. it is much less—about 60 m. on the average, though the Swedish frontier approaches within 6 m. of a head-branch of Ofoten Fjord, and the Russian within 19 m. of Lyngen Fjord. The length of the coast line is difficult to estimate; measured as an unbroken line it is nearly 1700 m., but including the fjords and greater islands it is set down as 12,000. The area is estimated at 124,495 sq. m.
Physical Features. Relief.—The main mountain system of the Scandinavian peninsula hardly deserves its name of Kjölen (the keel). It may rather be described as a plateau deprived of the appearance of a plateau, being on the one hand grooved by deep valleys, while on the other many salient peaks tower above its average level. Such peaks, during the later Glacial period, stood above the ice-field. Peaks and ridges were formed by the action of small glaciers cutting out each its circular hollow (botn) just as they still work on the remaining snow-fields. But where the power of the main ice-mass was at work, the characteristic rounded forms of base rock are seen, close above the sea along the coast, but even as high as 5000 ft. in some inland localities. The high plateau lies along the W. side of the peninsula, so that except in the S.E. Norway is mountainous throughout. Even the part excepted is hilly, but it partakes of the character of the long eastern or Swedish slope of the peninsula. Beyond the coast line their floors sink far below sea-level, and thus are formed the fjords and the belt of rugged islands which characterize almost the entire seaboard of Norway. Where Norway marches with Russia, a few heights exceed 3000 or even 4000 ft., but the land is not generally of great elevation. But from the point of junction with Swedish territory the mountains increase considerably in height. For a short distance, as far south as Lake Torne, the loftiest points lie within Norwegian territory, such as Jæggevarre (6283 ft.), between Lyngen and Ulfs fjords, and Kiste Fjeld (5653 ft.) farther inland. Thereafter the principal heights lie approximately along the crest-line of the plateau and within Swedish territory. Sulitelma, however (6158 ft.), lies on the frontier. Southward again the higher summits fall to Norway. S. of Bodö, Svartisen (“the black ice”), a magnificent snow-field bordering the coast, and feeding many glaciers, culminates at 5246 ft. Thereafter, Okstinderne or Oxtinderne (6273 ft.), and the Store Börge Fjeld (5587 ft.) are the principal elevations as far as 64° N. A little S. of this latitude the so-called Trondhjem depression is well marked right across the central upland, the height of the mountains not often exceeding 4000 ft., while the peaked form characteristic of the heights which rose clear of the glaciers of the later Glacial period is wanting. It is from this point too that Norwegian territory broadens so as to include not only the highest land in the peninsula, but a considerable part of the general E. and S.E. slope. The high plateau broadens and follows the S.W. sweep of the coast. Pursuing it S. the Dovre Fjeld is marked off by the valleys of the rivers Driva and Sundal, Laagen (or Laugen) and Rauma, and the fjords of the coast land of Nordmöre. Here Snehætta reaches a heightof 7615 ft., and the Romsdal (the name under which the Rauma valley is famous among tourists) is flanked by many abrupt jagged peaks up to 6000 ft. high. The valley of the Laagen forms the upper part of Gudbrandsdal. East of this and S.E. of the Dovre is another fjeld, Rondane, in which Högronden rises to 6929 ft. South of the Otta valley is Jotunheim or Jötun Fjeld, a sparsely peopled, in parts almost inaccessible, district, containing the highest mountains in Scandinavia, Galdhöpiggen reaching 8399 ft. On the seaward side of Jotunheim is Jostedalsbræ, a great snow-field in which Lodalskaupen reaches a height of 6795 ft. South of Sogne Fjord (61° N.) mountains between 5000 and 6000 ft. are rare; but in Hallingskarvet there are points about 6500 ft. high, and in the Hardanger Vidda (waste), a broad wild upland E. of Hardanger Fjord, Haarteigen reaches 6063 ft. The highland finally sinks towards the S. extremity of Norway in broken masses and short ranges of hills, separated by valleys radiating S.E., S. and W.
Glaciers.—The largest glacier in continental Europe is Jostedalsbræ, with an area of 580 sq. m., the snow-cap descending to 4000 or 4500 ft. Several of its branches fall nearly to the sea, as the Böiumsbræ above the Fjærland branch of Sogne Fjord. The largest branch is the Nigardsbræ. Skirting Hardanger Fjord, and nearly isolated by its main channel and two arms, is the great glacier of Folgefond (108 sq. m.). Two branches descending from the main mass are visited by many who penetrate the Hardanger—Buarbræ on the E., falling towards Lake Sandven above Odde, and Bondhusbræ on the W. The extreme elevation of the Folgefond in 5270 ft. Continuing N. other considerable snow-fields are those of Hallingskarvet, the Jotunheim, Snehætta in Dovre Fjeld, and Store Börge Fjeld at the head of the Namsen valley. Next follow Svartisen, second in extent to Jostedalsbræ (nearly 400 sq. m.), the Sulitelma snowfield and Jökel Fjeld, between Kvænang and Öxfjords. One glacier actually reaches the edge of Jökel Fjord, a branch of Kvænang Fjord, so that detached fragments of ice float away on the water. This is the only instance of the kind in Norway. The Seiland snow-field, on Seiland island near Hammerfest, is the most northerly névé in Europe. The snow-line in Norway is estimated at 3080 ft. in Seiland, 5150 ft. on Dovre Fjeld, and from 4100 to 4900 ft. in Jotunheim. The lowness of the snow-line adds to the grandeur of Norwegian mountains. Coast.—The flanks of the plateau fall abruptly to the sea almost throughout the coast-line, and its isolated fragments Skjærgaard or island-fence. appear in the innumerable islands which fringe the mainland. This island fringe, which has its counterpart in a modified form along the Swedish coast, is called in Norwegian the skjærgaard (skerry-fence, pronounced shārgoord). This fringe and the fjord-coast are most fully developed from Stavanger nearly as far as the North Cape. The channels within the islands are of incalculable value to coast wise navigation, which is the principal means of communication in Norway. The voyage northward from Stavanger may be made in quiet waters almost throughout. Only at rare intervals vessels must enter the open sea for a short distance, as off the port of Haugesund, or when rounding the promontory of the Stat or Statland, S. of Aalesund, passing the coast of Hustadviken, S. of Christiansund, or crossing the mouth of some large fjord. At some points large steamers, following the carefully marked channel, pass in deep water between rocks within a few yards on either hand. Small ships and boats, fishing or trading between the fjord-side villages, navigate the ramifying “leads” (leder) in security. In some narrow sounds, however, the tidal current is often exceedingly strong. The largest island of the skjærgaard is Hindö of the Lofoten and Vesteraalen group. Its area is 860 sq. m. The number of islands is estimated at 150,000 and their area at 8500 sq. m. Many of them are of great elevation, especially the more northerly; thus the jagged peaks characteristic of Lofoten culminate at about 4000 ft. Hornelen, near the mouth of Nordfjord, 3000 ft. high, rises nearly sheer above the Fröjfjord, and vessels pass close under the towering cliff. Torghatten (“the market hat”), N. of Namsos, is pierced through by a vast natural tunnel 400 ft. above the sea; and Hestmandö (“horseman island”), on the Arctic circle, is justly named from its form. The dark blue waters of the inner leads and fjords are clouded, and show a milky tinge on the surface imparted by the glacier-fed rivers. Bare rock is the dominant feature of the coast and islands, save where a few green fields surround a farmstead. In the N., where the snow-line sinks low, the scenery at all seasons has an Arctic character. Christiania Fjord, opening from the N. angle of the Cattegat and Skagerrack, differs from the great fjords of the W. Its Fjords. shores are neither so high nor so precipitous as theirs; it is shallower, and contains a great number of little islands. From its mouth, round Lindesnæs, and as far as the Bukken Fjord (Stavanger) there are many small fjords, while the skjærgaard provides an inner lead only intermittently. Immediately S. of Bukken Fjord, from a point N. of Egersund, the flat open coast of Jæderen, dangerous to shipping, fringing a narrow lowland abundant in peat-bogs for some 30 m., forms an unusual feature. Bukken Fjord is broad and island-studded, but throws off several inner arms, of which Lyse Fjord, near Stavanger, is remarkable for its extreme narrowness, and the steepness of its lofty shores. The Hardanger Fjord, penetrating the land for 114 m., is known to more visitors than any other owing to its southerly position; but its beauty is exceeded by that of Sogne Fjord and Nord Fjord farther N. Sogne is the largest and deepest fjord of all; its head is 136 m. from the sea, and its extreme depth approaches 700 fathoms. Stor Fjord opens inland from Aalesund, and one of its head branches, Geiranger Fjord, is among the most celebrated in Norway. Trondhjem Fjord, the next great fjord northward, which broadens inland from a narrow entrance, lacks grandeur, as the elevation of the land is reduced where the Trondhjem depression interrupts the average height of the plateau. The coast N. of Trondhjem, though far from losing its beauty, has not at first the grandeur of that to the south, nor are the fjords so extensive. The principal of these are Namsen, Folden and Vefsen, at the mouth of which is Alsten Island, with the mountains called Syv Söstre (Seven Sisters), and Ranen, not far S. of the Arctic circle. Svartisen sends its glaciers seaward, and the scenery increases in magnificence. Salten Fjord, to the N. of the great snow-field, is connected with Skjerstad Fjord by three narrow channels, where the water, at ebb and flow, forms powerful rapids. The scenery N. of Salten is unsurpassed. The Lofoten and Vesteraalen islands are separated from the mainland by the Vest Fjord, which is continued inland by Ofoten Fjord. If these two be considered as one fjord, its length is about 175 m., but the actual penetration of the mainland is little more than a fifth of this distance. The main fjords N. of Vesteraalen have a general northerly direction; among them is Lyngen Fjord near Tromsö, with high flanking cliffs and glaciers falling nearly to the sea. Alten Fjord is remarkable for the vegetation on its shores. From Lofoten N. there is a chain of larger islands, Senjen, Kvalö, Ringvadsö, Sorö, Stjernö, Seiland, Ingö and Magerö. These extend to the North Cape, but hereafter the skjærgaard ends abruptly. The coast to the E. is of widely different character; flat mountain wastes descend precipitously to the sea without any islands beyond, save Vardö, with two low islets at the E. extremity of Norway. The fjords are broader in proportion to their length. The chief are Porsanger, Laxe and Tana, opening N., and Varanger opening E. N. of this fjord the land is low and the landscape monotonous; on the S. a few island and branch fjords break the line of the shore. Stavanger Fjord has an extreme depth of 380 fathoms; Hardanger Fjord 355, Sogne Fjord 670, Nordfjord 340, Trondhjem Fjord 300, Ranen Fjord 235, Vestfjord 340, Alten Fjord 225, and Varanger Fjord 230. Marine terraces are met with in the E. of the country, and near Trondhjem, at 600 ft. above sea-level; and they are also seen at a slighter elevation at the heads of some western fjords. Moreover, at some points (as on the Jæderen coast) “giant kettles” may be observed close to sea-level, even below the level of high tide; and these glacial formations indicate the greater elevation of the land towards the close of the Glacial epoch. Former beach-lines are most commonly to be observed in northern Norway (e.g. in Alten Fjord), and in some cases there are two lines at different altitudes. The land above the raised beach is generally bare and unproductive, and human habitation tends to confine itself in consequence to the lower levels. rivers of considerable size, flowing roughly parallel but sometimes uniting as they approach the sea. The Glommen, rising N. of Röros in Aursund Lake, and flowing with a southerly curve parallel with the frontier for 350 m. to the Skagerrack, is the largest river in the Scandinavian peninsula. Its upper middle valley is called Österdal, the richest timber district in Norway. Its drainage area is 16,000 sq. m. Seven miles above its mouth it forms the fine Sarpsfos, and not far above this it traverses the large lake Öieren. A right bank tributary, the Vormen, has one of its sources (under the name of Laagen) in Lake Lesjekogen, which also drains in the opposite direction by the Rauma. The stream, after watering Gudbrandsdal, enters Mjösen, the largest lake in Norway. It is 60 m. long, but, like most of the greater Norwegian lakes, has no great breadth. It has, however, an extreme depth of 1500 ft. The Drammen river, which enters a western arm of Christiania Fjord below the town of Drammen, is the common outlet of several large rivers. The Hallingdal river drains the valley of that name, and forms Lake Kröderen, which is connected with the Drammen river by the Snarum. A short distance above the junction the Drammen flows out of Lake Tyrifjord, 50 sq. m. in area, into which flow the united waters of the Rand, from the valley district of Valdres, and the Bægna. The whole basin of the Drammen has an area of 6600 sq. m. The rivers between Christiania Fjord and Lindesnæs preserve the characteristics of those of the Glommen and Drammen systems. They rise on the Hardanger Vidda or adjacent uplands. The most important are the Laagen (to be distinguished from the river of that name in Gudbrandsdal), draining the Numedal; the Skien, the Nid and the Otter. Lakes are very numerous, the chief, beyond those already named, being Nordsjö on the Skien river, Tinsjö in the same system, which receives the river Maan, famous as forming the Rjukanfos (smoking fall) of 415 ft., and Nisservand on the Nid. The larger lakes lie, with a certain regularity, at elevations about 400 ft. above the sea, and it is considered that their basins were the heads of fjords when the land lay at a lower level, and were formed during an earlier glacial period than the present fjords. The great Lake Fæmund, lying E. of the Glommen valley and drained by the river of the same name, which becomes the Klar in Sweden, to which country it mainly belongs, is similar in type to the lakes of the northern highlands of Sweden. The streams of the coast of Jæderen reach the sea through sluggish channels, brown with peat. length from 70 to 100 m. The Stjördal, a beautiful wooded valley, leads up from the fjord to the lowest pass over the Trondhjem depression (at Storlien), and is followed by the railway from Trondhjem into Sweden. N. of Trondhjem Fjord, in spite of the close proximity of the mountains to the W. coast, several considerable rivers are found, flowing generally about N.E. or S.W. in valleys nearly parallel to the coast. Such are the Namsen (85 m. in length) and the Vefsen, discharging into Namsen Fjord and Vefsen Fjord respectively, and the Dunderland, flowing into Ranen Fjord. In the basin of the same fjord is the short Rös river, which drains Rös Vand, second in extent of the Norwegian lakes. In the extreme N., where the coastward slope is longer, there are such large rivers as the Alten, 98 m. long, discharging into the fjord of that name, and the Tana, also giving name to the fjord into which it flows, and forming a reat part of the Russo-Norwegian frontier. It is 180 m. long, and drains an area of 4000 sq. m.
Though the lakes of Norway are not comparable with those of Sweden as regards either number or size, they are very numerous and are estimated to cover somewhat less than one-fortieth of the total area. main rivers of Norway plunge in falls or rapids. Palaeozoic rocks, imperfectly covered by glacial and other recent deposits. The whole of the interval between the Devonian and the Glacial periods is represented, so far as is known, only by a small patch of Jurassic beds upon the island of Andö. An archaean zone stretches along the W. coast from Bergen to Hammerfest, interrupted towards the N., by overlying patches of Palaeozoic deposits. Gneiss predominates, but other crystalline rocks occur subordinately. The Lofoten Islands consist chiefly of eruptive granite, syenite and gabbro. S. of a line drawn from the head of the Hardanger Fjord to Lake Mjösen is another great Archaean area. Here again gneiss and granite form the greater part of the mass, but in Telemarken there are also conglomerates, sandstones and clay-slates which are believed to be Archaean. Between these two Archaean areas the Lower Palaeozoic rocks form a nearly continuous belt which follows approximately the watershed of the peninsula and extends from Bergen and Stavanger on the S. to the North Cape and Vardo in the N. They occur also as a broad strip inlaid in the Archaean floor, from the Christiania Fjord northward to Lake Mjösen. A line drawn from the Nase to the North Cape coincides roughly with a marked change in the character and structure of the Palaeozoic beds. East of this line even the Cambrian beds are free from over folding, over thrusting regional metamorphism. They lie flat upon the Archaean floor, or have been faulted into it in strips, and they are little altered except in the neighbourhood of igneous intrusions. W. of the line rocks have been folded and metamorphosed to such an extent that it is often difficult to distinguish the Palaeozoic rocks from the Archaean. They form in fact a mountain chain of ancient date similar in structure to the Alps or the Himalayas. 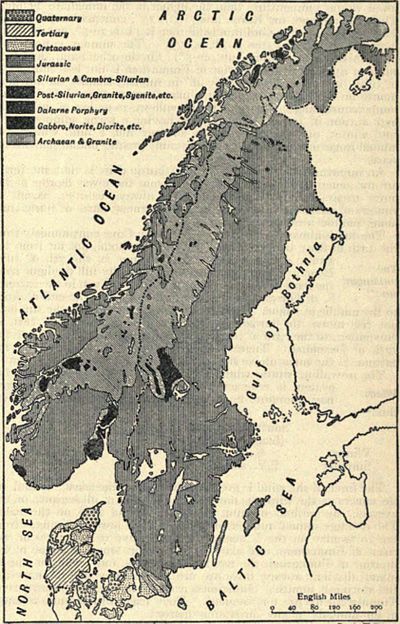 The relations of the two areas have been studied by A. E. Törnebohm in the Trondhjem region, and he has shown that the western mass has been pushed over the eastern upon a great thrust-plane. The relations, in fact, are similar to those between the Dalradian schists of the Scottish Highlands and the Cambrian beds of the W. coast of Sutherland. In Scotland, however, it is the eastern rocks which have been pushed over the western. Corresponding with the difference in structure between the E. and the W. regions there is a certain difference in the nature of the deposits themselves. In the Christiania district the Cambrian, Ordovician and Silurian beds consist chiefly of shales and limestones. Farther north sandstones predominate, and especially the Sparagmite, a felspathic sandstone or arkose at the base of the Cambrian; but the deposits are still sedimentary. In the Trondhjem district, on the other hand, belonging to the folded belt, basic tuffs and lavas are interstratified with the normal deposits, showing that in this region there was great volcanic activity during the early part of the Palaeozoic era. In both the E. and the W. region the Devonian is probably represented by a few patches of red sandstone, in which none but obscure remains of fossils have yet been found. It may be noted here that in the extreme N. of Norway, E. of the North Cape, there is a sandstone not unlike the Sparagmite of the S., which is said by Reusch to contain ice-worn pebbles and to rest upon a striated pavement of Archaean rocks. and have been observed as high as 3000 ft. above the sea. of several different types of rock. Fjeldberg) there is an average of 200 such days, and at Christiania about 120. On the S.W. coast there is no day of which the mean temperature falls below 32°; the most westerly insular stations, however, such as Utsire and Skudeness off Bukken Fjord, record frost during some part of 60 days. The lowest winter average temperature is found in a centre of cold in the N. which extends over Swedish and Russian territory as well as Norwegian. The Norwegian station of Karasjok, within it, records 4° during December, January and February, and in this area there have also been observed the extreme minima of temperature in the country, e.g. 60.5° below zero at Karasjok. The contrast with the S.W. coast may be continued. Here at some of the island stations, the coldest month, February, has an average about 35°, and the lowest temperature recorded at Ona near Christiansund is 10.5°. It may be noted here that in several cases the lower-lying inland stations in the south show a distinctly lower winter temperature than the higher in the immediate vicinity. Thus the average for Röros (2067 ft.), 13°, contrasts with 11° for Tönset; at Listad in Gudbrandsdal (909 ft.) it is 16.5°, but at Jerkin in the Dovre Fjeld (3160 ft.) it is 17.5°. The summer is hottest in S.E. Norway (Christiania, July, 62.5°). On the other hand, the lowest summer average in the interior of Finmarken is not less than 53.5° in July; but at Vardö it is only 48° in August, usually the warmest month on this coast. In the lofty inland tracts of the S.E. the July temperature ranges, from 59° in the valleys, to as low as 49° at the high station of Jerkin. The interior having a warm summer and a cold winter, and the coast a cool summer and a mild winter, the annual range of temperature is remarkably greater inland than on the coast. An important result of the warm Atlantic drift is that the fjords are not penetrated by the cold water from the lower depths of the outer ocean, and in consequence are always ice-free, except in winters of exceptional severity in the innermost parts of fjords, and along shallow stretches of coast. extreme S. the sun is above the horizon for 6½ hours at mid-winter. Summer S.W. to W. N. N.
the contrary, the winter is normally calm; and at all seasons, on the average, the periods of calm are longer inland than on the coast. The average annual number of stormy days, however, ranges from ten to twenty on the S. coast, from forty-five to sixty-two on the coast of Finmarken, and sixty to seventy at Ona; whereas in the interior of Finmarken the average number is four, while in the S. inland districts stormy days are rare. December and January are the stormiest months. Hailstones are rare and seldom destructive. Thunderstorms are not frequent. They reach a maximum average of ten annually in the Christiania district. The number of days on which rain or snow falls is greatest on the coast from Jæderen to Vardö, least in the S.E. districts and the interior of Finmarken. At the North Cape, in Lofoten, and along the W. coast between the Stad and Sogne Fjord, precipitation occurs on about 200 days in the year, although by contrast in the inner part of Sogne Fjord there is precipitation only on 121 days. On Dovre Fjeld and the SE; coast the average is about 100 days. Snowfall occurs least frequently in the S. (e.g. at Mandal, 25 snowy days out of 116 on which precipitation occurs), increasing to 50 at Christiania, or Dovre Fjeld, and about the mouth of Trondhjem Fjord, to 90 at Vardö, and to 100 at the North Cape. From Vardö to the Dovre Fjeld and in the upland tracts, snow occurs at least as frequently as rain. Snowfall has been recorded in all months on the coast as far S. as Lofoten. The amount of precipitation is greatest on the coast, where, at certain points on the mainland between Bukken Fjord and Nordfjord, an annual average of 83 in. is reached or even exceeded. On the outer islands there is a slight decrease; inland the decrease is rapid and great. In Dovre Fjeld a minimum of 12 in. is found. In the extreme S. of the country the average is 39 in., N. of Trondhjem Fjord 53 in. are recorded, and there is a well-marked maximum of 59 in. at Svolvær in Lofoten, N. of which there is a diminution along the coast to 26 in. at the North Cape. In the northern interior a minimum of 16 in. is recorded. Strongly marked local variations are observed. The amount of cloudiness is on the whole great. The coast of Finmarken has over three cloudy days to one clear day; in the interior of the country clear and cloudy days are about equally divided. Fog is most frequent on the W. and N.W. coasts in summer; on the S.E. coast in winter. In winter a frosty fog often occurs about the heads of the fjords during severe cold or with a breeze from the land. Flora.—The forests of Norway consist chiefly of conifers. The principal forest regions are the S.E. and S. Here, in the Trondhjem district, and in Nordland there are extensive forests of pine and fir. In the coastal and fjord region of the W. the pine is the only coniferous forest tree, and forests are of insignificant extent. In S. Norway the highest limit of conifers is from 2500 to 3000 ft. above sea-level; in the inland parts of the Trondhjem region it is from 1600 to 2000 ft. (though on the coast only from 600 to 1200); farther N. it falls to 700 ft. about 70° N. The birch belt reaches 3,000 to 3500 ft. Next follow various species of willows, and the dwarf birch (betula nana), and last of all, before the snow-line, the lichen belt, in which the reindeer moss (cladonia rangiferina) is always conspicuous. A few trees of the willow belt sometimes extend close up to the snow-line. In the S. and less elevated districts the lowest zone of forests includes the ash, elm, lime, oak, beech and black alder; but the beech is rare, flourishing only in the Laurvik district. The snow ranunculus and the Alpine heather are abundant. The Dovre Fjeld is noted as the district in which the Arctic flora may be studied in greatest variety and within comparatively narrow limits. On the coastal banks the marine flora is very finely developed. Fauna.—The great forests are still the haunt of the bear, the lynx, and the wolf. Bears are found chiefly in the uplands N. of Trondhjem, in the Telemark and the W. highlands, but the cutting of forests has limited their range. The wolves decreased very suddenly in S. Norway about the middle of the 19th century, probably owing to disease, but are still abundant in Finmarken, and the worst enemy of the herds of tame reindeer. The elk occurs in the eastern forests, and northward to Namdal and the Vefsen district. The red deer is confined chiefly to the W. coast districts; its principal haunt is the island of Hitteren, off the Trondhjem Fjord. On the high fields are found the wild reindeer, glutton, lemming and the fox (which is of wide distribution). The wild reindeer has decreased, though large tame herds are kept in some parts, especially in the N. The lemming is noted for its curious periodic migrations; at such times vast numbers of these small animals spread over the country from their upland homes, even swimming lakes and fjords in their journeys. They are pursued by beasts and birds of prey, and even the reindeer kill them for the sake of the vegetable matter they contain. Hares are very common all over Norway up to the snow-line. The beaver still occurs in the Christiansand district. S. being richer than the W., while the N. is distinct from either in the number of peculiarly arctic insects. Sport.—Norway is much frequented by British anglers. Moderate rod-fishing for trout is to be obtained in many parts. But most of the owners of water rights have a full appreciation of the value of good fishing to sportsmen, especially when netting rights are given up for the sake of rod-fishing. The same applies to good shooting. Foreigners may not shoot without a licence, the cost of which is 100 kroner (£5 : 11 : 0) whether on crown lands or on private properties, whose owners always possess the shooting rights. Population.—The resident population of Norway in 1900 was 2,221,477. The Table shows the area and population of each of the administrative divisions (amt, commonly translated “county”). Norway is, as a whole, the most thinly populated of the political divisions of Europe. It may be noted for the sake of comparison that the density of population in the most sparsely populated English county, Westmorland, is about equalled by that in Smaalenene amt (85 per sq. m.), and considerably exceeded in Jarlsberg and Laurvik amt (112.7 per sq. m.), but is not nearly approached in any other Norwegian county. The two counties named are small and lie almost wholly within the coastal strip along the Skagerrack, which, with the coast-lands about Stavanger, Haugesund, Bergen and Trondhjem, the outer Lofoten Islands and the land about Lake Mjösen, are the most thickly populated portions of the country, the density exceeding 50 persons per sq. m. A vast area practically uninhabited, save in the N. by nomadic Lapps, reaches from the north most point of the Norwegian frontier as far S. as the middle of Hedemarken, excepting a markedly more populous belt across the Trondhjem depression. Thus of the counties, Finmarken is the least thickly populated (1.8 per sq. m.). In such highland regions as Jotunheim and Hardanger Vidda habitations are hardly less scanty than in the N. About two-thirds of the population, then, dwell by the coast and fjords, and about one-quarter in the inland lowlands, leaving a very small upland population. The rural and urban populations form respectively about 76 and 24% of the whole. Of the chief towns of Norway, Christiania, the capital, had a population in 1900 of 229,101, Bergen of 72,179, Trondhjem of 38,156, Stavanger of 30,541, Drammen of 23,093. The towns with populations between 15,000 and 10,000 are Christiansand, Fredrikstad, Christiansund, Fredrikshald, Aalesund, Skien, Arendal and Laurvik. All these are ports. The population of Norway in 1801 was returned as 883,038. A rapid increase obtained from 1815 to 1835, a lesser increase thereafter till 1865, and a very slight increase till 1890. The second half of the 19th century, down to 1890, was the period of heaviest emigration from Norway. The vast majority of Norwegian emigrants go to the United States of America. But emigration slackened in the last decade of the 19th century, during which period the movement from rural districts to towns, which had decreased from about the middle of the century, revived. The number of Norwegians abroad may be taken at 350,000. The Lapps, commonly called Finns by the Norwegians, and confined especially to Finmarken (which is named from them), are estimated at 1% of the population. There are also a few Finns (about half the number of Lapps), whom the Norwegians call Kvæner, a name of early origin. The excess of births over deaths, about as 1.4 to 1, is much above the European average; the death-rate is also unusually low. The number of marriages is rather low, and the average age of marriage is high. The percentage of illegitimacy has shown some increase, but is not so high as in Sweden or Denmark. The percentage of longevity is high. The preponderance of females over males (about 1073 to 1000) is partly accounted for by the number of males who emigrate. The higher mortality of males is traced in part to the dangers of a seafaring life. Down to the middle of the 19th century drunkenness was a strongly-marked characteristic of Norwegians. A strict licensing system was then introduced with success. Local boards were given a wide control over the issue of licences, and in 1871 companies (samlag) were introduced to monopolize and control the retail trade in spirits. Their profits do not, as in the Gothenburg system, go to the municipal funds, but are applied directly to objects of public utility. In 1894 a general referendum resulted in the entire prohibition of the sale of spirits in some towns for five years. The control of retail trade in beer and wine by the samlag has been introduced to some extent. In Norway a strongly individual national character is to be expected, combined with conservatism of ancient customs and practices. The one finds no better illustration than the individuality of modern Norwegian music and painting. The other is still strong. Such customs as the lighting of the midsummer fires and the attendant celebrations still survive. Peculiar local costumes are still met with, such as those associated with weddings. In the coast wise shipping trade and the fisheries of the north, high-prowed square-sailed boats are frequently employed which are the direct descendants of the vessels of the early Vikings. Some examples of the ancient farmstead, composed of a group of wooden buildings each of a single chamber, are preserved, and medieval ornamental woodwork is met with. Wood is the principal building material except in some larger towns where brick and stone have superseded it. Where this is not the case, fires have left few, if any, ancient domestic buildings, but the preservation of ancient models in wooden houses makes Norwegian towns peculiarly picturesque. Norway retains a few highly interesting examples of ecclesiastical architecture. There are the peculiar small wooden churches (stavekirke) dating from the 11th to the 14th century, with high-pitched roofs rising in tiers so as to give the building something of the form of a pyramid. The roofs are beautifully shingled in wood. The wall timbers are vertical. To protect them from the weather, the roofs overhang deeply, and the lowest sometimes covers a species of external colonnade. The carving is often very rich. The most famous of these churches is that of Borgund near Laerdalsören; another fine example is at Hitterdal on the Kongsberg-Telemark road. On the other hand there are a few Romanesque and Gothic stone churches. In some of these the influence of English architecture is clear, as in the metropolitan cathedral of Trondhjem and the nave of Stavanger cathedral. St Mary's Church at Bergen, however, tends towards the French models. A good example of the smaller stone church is at Vossevangen, and there are several of Late Romanesque character in the Trondhjem district. There are ruins of a cathedral at Hamar, and a few monastic remains, as at Utstein, north of Stavanger, and on the island of Selje off Statland. Remains of pure Early English work are occasionally found, as at Ogne in Jæderen, but the later Gothic styles were not developed in Norway. the highest engineering skill, were not brought into existence until the last half of the 19th century. A Highways Act of 1851 placed the roads under the immediate control of local authorities, but government grants are made for the construction not only of main roads, but in many cases of cross-roads also. In a country where railways are few, posting is of prime importance, and in Norway the system is well developed and regulated. Along all main roads there are posting stations (skydsstationer, pronounced shüssstashöner), hotels, inns or farms, whose owners are bound to have horses always in readiness; at some stations on less frequented roads time is allowed for them to be procured. Posting stations are under strict control and the tariff is fixed. The vehicles are the stolkjærre (pronounced approximately stolchārer) for two passengers, and the kariol or carriole for one. A similar posting system obtains by rowing-boats on lakes and fjords. The first railway, that between Christiania and Eidsvold, was constructed by agreement between British capitalists and the Railways. Norwegian government, and opened in 1854. The total length of railways is only about 1600 m., Norway having the lowest railway mileage in proportion to area of any European state, though in proportion to population the length of lines is comparatively great. Almost the whole are state lines. Railways are most fully developed in the S.E., both N. and S. of Christiania. The principal trunk line connects Christiania with Trondhjem by way of Hamar and the Osterdal, Röros and Stören. Four lines cross the frontier into Sweden—from Christiania by Kongsvinger (Kongsvinger railway) and by Fredrikshald (Smaalenenes railway), from Trondhjem by Storlien (Meraker railway), and from Narvik on Ofoten Fjord, the most northerly line in the world. Among other important lines may be mentioned that serving Lillehammer, Otta, &c., in Gudbrandsdal, that running S.W. from Christiania to Drammen, Skien and Laurvik; the Sætersdal line N. from Christiansand; the Jæderen line from Stavanger to Egersund and Flekkefjord; the Bergen-Vossevangen line; and the branch from Hell on the Meraker railway northward to Levanger. These local lines form links in important schemes for trunk lines. Norwegian railways are divided between the standard gauge and one of 3 ft.
6 in. ; on the N. line a change of gauge is made at Hamar. in the Telemark with Skien. telephone systems are exceptionally extensive. to the Trondhjem-Namsen district. Lumbering is an important industry. Forestry is controlled by the Department of Agriculture, and its higher branches are taught at the Aas college. Fisheries.—The sea fisheries are of high economic importance. The principal are the cod fisheries. In March and April the cod shoal on the coastal banks for the purpose of spawning, and this gives rise to the well-known fishery for which the Lofoten Islands are the principal base. In April and May shoals of capelan appear off Finmarken, followed by cod and other fish, small whales, &c., which prey upon them; this affords a second fishery. For herring there is a spring fishery off Stavanger and Haugesund, and one in November and December off Nordland. Mackerel fisheries are important from Trondhjem Fjord S. to the Skagerrack. Salmon and sea-trout fisheries are important in the rivers and still more off the coast. Fishermen from Tönsberg, Tromsö, Hammerfest, Vardö, Vadsö, &c., work with the arctic fisheries, sealing, whaling, &c., from Greenland to Spitsbergen and Novaya Zemlya. A fishery board at Bergen administers the Norwegian fisheries. The annual value of the coast fisheries ranges from £1,000,000 to £1,500,000. Mining.—Norway is not rich in minerals. Coal occurs only on Andö, an island in Vesteraalen. Silver is mined at Kongsberg; copper at Röros, Sulitelma, and Aamdal in Telemarken; iron at Klodeberg near Arendal and in the Dunderlandsdal (developed early in the 20th century). Granite is quarried near Fredrikstad, Fredrikshald and Sarpsborg, and exported as paving setts and kerbstones, mostly to Great Britain and Germany. Good marble is found near Fredrikshald, and also in the Salten and Ranen districts. Manufacturing Industries.—The most important are works connected with the timber trade, foundries and engineering shops, spinning and weaving mills, brick and tile works, breweries, paper mills, tobacco factories, flour-mills, glass works, and potteries, nail works, shipbuilding yards, rope works, factories for preserved food (especially fish), margarine, matches, fish guano, boots, and hosiery, distilleries and tanneries. The chief industrial centres are Christiania, Bergen, Fredrikstad and Sarpsborg, Drammen, Skien and Porsgrund, Trondhjem, Fredrikshald and Stavanger. Large water-power is available in many districts. A powerful impulse was given to industrial enterprise by the non-renewal of the customs treaty with Sweden in 1897, which established a protective systerr against that country. Government.—Norway is an independent, constitutional and hereditary monarchy, the union with Sweden having been dissolved on the 7th of June 1905, after lasting 91 years. The constitution rests on the fundamental law (grundlov) promulgated at Eidsvold on the 17th of May 1814, and altered in detail at various times. The executive is vested in the king, who comes of age at eighteen. His authority is exercised through, and responsibility for his official acts rests with, a council of state consisting of a minister and councillors, who are the heads of finance, public accounts, church and education, defence, public works, agriculture, commerce, navigation and industry and foreign affairs. The king appoints these councillors and high officials generally in the state, church, army, navy, &c. He can issue provisional ordinances pending a meeting of parliament, can declare war (if a war of offence, only with the consent of parliament) and conclude peace, and has supreme command of the army and navy. The legislative body is the parliament (storthing), the members of which are elected directly by the people divided into electoral divisions, each returning one member. Until the election of 1906 the members were chosen by electors nominated by the voters. Elections take place every three years. The franchise is extended to every Norwegian male who has passed his twenty-fifth year, has resided five years in the country, and fulfils the legal conditions of citizenship. Under the same conditions, and if they or their husbands have paid taxes for the past year, the franchise is extended to women under a measure adopted by the Storthing in June 1907. Members of parliament must possess the franchise in their constituency, and must have resided ten years in the country; their age must not be less than thirty. The Storthing meets at Christiania, normally for two months in each year; it must receive royal assent to the prolongation of a session. After the opening of parliament the assembly divides itself into two sections, the upper (lagthing) consisting of one-quarter of the total number of members, and the lower (odelsthing) of the remainder. Every bill must be introduced in the Odelsthing; if passed there it is sent to the Lagthing, and if carried there also the royal assent gives it the force of law. If a measure is twice passed by the Odelsthing and rejected by the Lagthing, it is decided by a majority of two-thirds of the combined sections. The king has a veto, but if a measure once or twice vetoed is passed by three successive parliaments it becomes law ipso facto. This occurred when in 1899 the Norwegians insisted on removing the sign of union with Sweden from the flag of the mercantile marine. Members of parliament are paid 13s. 4d. a day during session and their travelling expenses. Parliament fixes taxation, and has control of the members of the council of state, who are not allowed to vote in either house, though they may speak. 5½ millions sterling. Considerable sums, however, have been raised by loans, principally for railways. These amounted, between 1900 and 1906 (the financial year ending the 31st of March) to nearly £4,500,000. The principal sources of revenue are customs, railways, post office and telegraphs, the income tax (which is graduated and not levied on incomes below 1000 kroner or £55, 6s. 8d. ), and excise. The principal items of expenditure are railways, defence (principally the army), the post office, interest on debt, the church and education, and justice. The Bank of Norway is a private joint-stock corporation, in which the state has large interests. It is governed by special acts of parliament, and its chief officials are publicly appointed. It alone has the right to issue notes, which are in wide circulation. The Mortgage Bank (Norges Hypothekbank) was established by the state to grant loans on real estate. The currency of Norway is based on a gold standard; but the monetary unit is the krone (crown), of 1s. 1⅓d. value, divided into 100 öre. The metric system is in use. of mediation (forligelseskommission), from which an appeal lies to the local inferior courts, which are also tribunals of first instance, and are worked by judges on circuit and assessors. There are three superior courts of appeal (overretter), at Christiania, Bergen and Trondhjem, and one supreme court (höiesteret). Criminal cases are tried either in jury courts (lagmandsret) or courts of assize (meddomsret). The first is for more serious offences; the second deals with minor offences and is a court of first instance. Military crimes are dealt with by a military judicial organization. Finally there is a high court of impeachment (rigsret), before which members of parliament, the government, &c., are tried for misdemeanours committed in their public capacity. Local Government.—The country is divided into twenty counties (amter) (see population), the cities of Christiania and Bergen being included in these. Other towns are formed into communes, governed by representatives, from whom a council (formænd) is elected by themselves. Rural communes (herreder) are similarly administered, and their chairmen form a county council (amtsthing) for each county. At the head is the amtmand, the county governor. The electoral franchise for local council election is for men the same as the parliamentary franchise, and, like it, is extended in a limited degree to women. Religion and Education.—The state religion, to which the king must conform, is Evangelical Lutheran. Only about 2.4% of the population are dissenters. All Christian sects except Jesuits are tolerated. The king nominates the clergy of the established church. Norway is divided into six bishoprics (stifter), Christiania, Hamar, Christiansand, Bergen, Trondhjem, Tromsö; and these into deaneries (provstier), with subdivisions into clerical districts (præstegjeld), parishes and sub-parishes. The clergy take a leading part in primary education, which, in spite of the difficulties arising in a sparsely populated country, reaches a high standard. Education is compulsory, the school-going age being from 6½ to 14 years in towns and 7 to 14 years in the country. About 94% of the children of school-going age attend the primary schools, which are administered by school boards in the municipalities and the counties. Teachers must belong to the established church. Their training colleges include one free public college in each diocese. The municipalities and counties bear the cost of primary education with a state grant. There are continuation schools, evening schools, &c., and for secondary education, communal middle schools, and state gymnasier. There is a state-aided university at Christiania. “Braendevinsbolagene i Norge,” in Nordisk Tidskrift (1891). Early History.—Archaeological and geological researches have revealed a fishing and hunting population in Norway, possibly as far back as c. 6000 B.C. Until lately this aboriginal people, which was certainly non-Aryan, was held to be Lappish, but recent investigations seem to show that the Lapps only entered Norway about A.D. 900-1000, and that the original population was probably of Finnish race, though only distantly allied to the Ugro-Finns now inhabiting Finland. To them belong perhaps certain non-Aryan names for natural features of the country, such as Toten, Vefsen, Bukn. The time of the immigration of a Teutonic element is far from certain. It did not extend N. beyond the Trondhjem district Teutonic immigration. until about the beginning of our era, but there can be little doubt that the immigrants' advance was extremely slow, and it is suggested, on the evidence of archaeology, that the Teutonic element entered S. Norway towards the end of the (Scandinavian) later Stone age, c. 1700 B.C. (see Scandinavian Civilization). But whatever were the stages of the process, the language of the older race was superseded by Teutonic, and those aborigines who were not incorporated (probably most often as slaves) were driven into the mountains or the islands that fringe the coast. In the highlands the “Finns” maintained some independence down to historical times. The old English poem Beowulf mentions a “Finnaland” which should perhaps be located in S. Norway in about the 6th century, and later on the ancient laws of this region forbid the practice of visiting the “Finns” to obtain knowledge of the future. But only in Finmark, which even in the 13th century stretched far into Sweden and included the Norwegian district of Tromsö, could the earlier inhabitants live their old life, and here they finally fell into the utmost want and misery. Their existence is mentioned as a thing of the past by a North Trondhjem writer in 1689. The new Teutonic element of population seems to have flowed into Norway from two centres; one western, probably from Jutland, the other eastern, from the W. coast of Sweden. The western stream covered Agder, Rogaland and Hordaland (the modern districts of Christiansand and Söndre Bergenhus), and finally extended N. as far as Söndmöre, while the eastern stream flowed across Romerike and Hadeland through the Dales to the Trondhjem district, where it divided, one stream flowing down the W. coast till it met the western settlements, another penetrating N. into Haalogaland (which included the modern Nordland as well as Helgeland), and a third E. into the N. Swedish districts of Jämtland and Helsingland. The bodies of immigrants were no doubt more or less independent, and each was probably under a king. It is probable that the Horder, who gave their name to Hordaland and Hardanger, were a branch of the Harudes whom Ptolemy in the 2nd century mentions as living in Jutland, where their name remains in the present Hardesyssel. The Ryger, who gave their name to Rogaland, and the modern Ryfylke, are probably akin to the Rugii, an E. Germanic tribe at one time settled in N.E. Pomerania, where we have a reminiscence of their name in Rügenwalde. The first mention of any tribe settled in Norway is by Ptolemy, who speaks of the Chaidenoi or Heiner, inhabiting the W. of his island Scandia. The system of settlement in Norway appears to have been different from that adopted by the same race in other lands. In Denmark, for instance, a group of as many as twenty settlers held land more or less in common, but this system, which demanded that a considerable extent of land should be readily accessible, was not feasible in the greater part of Norway, and except in one or two flatter districts each farm was owned, or at least worked, by a single family. When history first sheds a faint light over Norway we find each small district or “fylke” (Old Norse fylkir, from folk, army) settled under its own king, and about twenty-nine Early kingship. fylker in the country. At times a king would win an overlordship over the neighbouring tribes, but the character of the country hindered permanent assimilation. The king always possessed a hird, or company of warriors sworn to his service, and indeed royal birth and the possession of such a hird, and not land or subjects, were the essential attributes of a king. There was no law of primogeniture, and on the death of a king some of his heirs would take their share of the patrimony in valuables, gather a hird, and spend their lives in warlike expeditions (see Vikings), while one would settle down and become king of the fylke. There are indications that these conditions were fostered by a matriarchal system, and that it would often occur that a wandering king would marry the daughter of a fylkes-king and become his heir. Probably the king's power was only absolute over his own hird. He was certainly commander-in-chief and perhaps chief priest of the fylke, but the administrative power was chiefly in the hands of the herser and possibly of an earl. The position of earls is vague, but it is noticeable that both those of whom we hear in Harald Haarfager's time take the opposite side to their king. The herser (Old Norse hersir), of whom there were several in each fylke, united high birth with wealth and political power, and with the holder, the class of privileged hereditary landowners from which they sprang, formed an aristocracy of which there seems little trace in the other Scandinavian countries at this period. Its rise in Norway is perhaps due to the fact that the nature of the country, as well as the individualistic system of settlement, left more scope for inequalities of wealth than in Denmark or Sweden. Once a family had become wealthy enough to fit out Viking ships, it must have added wealth to wealth, besides enormously raising its prestige. The lands of almost all the most powerful families were on islands, whence it was easy to set forth on roving expeditions. The family property of the earls of Lade, for instance, whose representative in the latter half of the 9th century was the most powerful man of the district, was on the island of Nærö. These islands had been the refuge of the aborigines, and it is possible that, as A. Hansen has suggested, the rise of the aristocracy depends here, as elsewhere, on a subject population. Among the proper names of thralls in a poem in the Elder Edda are several which can only be explained on the hypothesis that they are Finnish, e.g. Klums, Lasmer, Drumba. Harald Haarfager's decree concerning “those who clear forests and burn salt, fishermen and hunters” probably refers to the Finns as a class apart. There can be no doubt that, in Haalogaland for instance, the aristocracy gained its wealth not only from the tribute extorted from the Finns in Finmark, but also from slave labour. The eight Trondhjem fylker had a common Thing or assembly very early, but these districts were remote, while the wealthy western districts were too much cut off from each other to unite effectively, though here also a common Thing was early established. The first successful attempt at unification originated round Vestfold, the modern Jarlsberg and Laurvik Amt on the Christiania fjord. Here also there was a certain degree of union very early, and it is possible that national feeling was fostered by proximity to the Danish and Swedish kingdoms. The district was thickly populated, and a centre of commerce. Tradition made the royal family a branch of the great Yngling dynasty of Upsala, which claimed descent from the god Frey. Through several generations this family had extended its kingdom by marriage, conquest and inheritance, and by the end of the reign of Halfdan the Black, it included the greater part of Hamar and Oslo Stift, and the fylke of Sogn, the district round the modern Sognefjord. Halfdan's son, Harald Haarfager, having no brothers, succeeded to the whole kingdom, and was further fortunate in that Harald Haarfager. an uncle helped him to maintain his rights. By 866 his power was so well established in S. Norway that he contemplated the conquest of the whole land. The chief obstacle appears to have been the resistance, not only of the petty kings, but also of the aristocratic families, who dreaded the power of a monarchy established by force, and consequently supported the vaguer authority of their own kinglets. There can be no doubt that Harald introduced a feudal view of obligations towards the king, and landowning families, who had regarded their odel, or inherited property, as absolutely their own, resented being forced to pay dues on it. In each district Harald offered the herser the opportunity of becoming his vassals, answerable to him for the government of the district. The increased dues and the grants of land made by Harald rendered the position of one of his earls more lucrative than that of king under the older system; and it shows to what a paramount position the old aristocracy must have attained, that numbers of the herser and holder could not reconcile themselves to the limitation of their independence, but quitted the lands which were their real title to influence, rather than submit to the new order. But the little kingdoms only made futile attempts at combination, except in the western districts of Agde (comprising the modern Lister and Mandal and Nedenæs), Rogaland and Hordaland. Here was the home of the “western Vikings” who for nearly a century had owed wealth and fame to their raids on the British Isles. Attack by land was impossible, and Harald had to gather men and ships for three years before he could meet the fleet of the allied kings at Hafsfjord. The battle (872) resulted in a victory to him, and with it all opposition in Norway was at an end. An expedition to Scotland and the Scottish isles (c. 891) dispersed enemies who could harry the Norwegian coast, many of them taking refuge in Iceland; and the earldom of the Orkneys and Shetlands became an appanage of the Norwegian Crown. For the moment the whole country was under a single king, but Harald himself destroyed his work, in accordance with old custom, by giving about twenty of his sons the title of king, and dividing the country among them, only qualifying this retrograde step by installing his favourite son Erik Blodöxe as over-king (930). Moreover, Harald had established no common Thing for the whole of his kingdom. Norway is naturally divided into three parts, and each of these remained more or less separate for centuries, even having separate laws until the second half of the 13th century. The Frostathing district (so called from Frosta near Trondhjem) included the eight Trondhjem fylker, and also Naumdal, Nordmöre and Raumsdal. The Gulathing district consisted of Söndmöre, Firdafylke, Sogn, Valdres, Hallingdal, Hordaland and Agde, and met at Gula in Hordaland. The third, the Eidsivathing, met on the shores of Lake Mjösen, and included the Uplands and also the “Vik,” i.e. all the districts round Christiania fjord, until St Olaf established the Borgarthing at Sarpsborg as a centre for these latter. The king's council was composed of the local lendermænd, and thus varied with the district he happened to be visiting, an arrangement that had its advantages, since the local chiefs were acquainted with the laws of their district, though it was another hindrance to unification. It was only in 1319 that a permanent council was formed, the Rigets Raad. Harald died in 933. Erik Blodöxe (Bloody-axe) only managed to rid himself of two rival over-kings, Olaf and Sigfred, his Haakon the Good. half-brothers, for on hearing of his father's death, another son, Haakon (q.v. ), called the Good, who had been brought up at Æthelstan's court, came to Norway with a small force and succeeded in ejecting Erik (934), After Haakon's death in 961 at the battle of Fitje, where his long struggle against Erik's sons and their Danish allies terminated, these brothers, headed by Harald Graafeld (grey-cloak) became masters of the W. districts, though the ruling spirit appears to have been their mother Gunhild. Earl Sigurd of Lade ruled the N., and the S. was held by vassal kings whom Haakon had left undisturbed. By 969 the brothers had succeeded in ridding themselves of Sigurd and two other rivals, but the following year Harald Graafeld was lured to Denmark and treacherously killed at the instigation of Earl Haakon, son of Sigurd, who had allied himself with the Danish king Harald Gormssön. With the latter's support Earl Haakon won Norway, but threw off his yoke on defeating Ragnfred Erikssön at Tingenes in 972. The S.E. districts were, however, still held by Harald Grenske, whose father had been slain by the sons of Erik. Haakon ruled ably though tyrannically, and his prestige was greatly increased by his victory over the Jomsvikings, a band of pirates inhabiting the island of Wollin at the mouth of the Oder, who had collected a large fleet to attack Norway. The date of their defeat at Hjörungavaag, now Lidvaag, is uncertain. But finally the earl's disregard of the feelings of the most powerful “bonder,” or landed proprietors, worked them up to revolt, and, in 995, there landed in Norway Olaf, great-grandson of Harald Haarfager and son of the king Tryggve of the Vik whom Gudröd Eriksson had slain, and whose father Olaf had been slain by Erik Blodöxe. The earl was treacherously killed by his thrall while in hiding, and Olaf entered unopposed upon his short and brilliant reign. Introduction of Christianity by Olaf. His great work was the enforced conversion to Christianity of Norway, Iceland and Greenland. In this undertaking both Olaf and his successor and namesake looked for help to England, whence they obtained a bishop and priests; hence it comes that the organization of the early church in Norway resembles that of England. No more than England did Norway escape the struggle between Church and State, but the hierarchical party in Norway only rose to power after the establishment of an archiepiscopal see at Trondhjem in 1152, after which the quarrel raged for over a century. Until the year 1100, when tithes were imposed, the priests depended for their livelihood on their dues, and Adam of Bremen informs us that this made them very avaricious. In the year 1000 Olaf fell at the battle of Svolder off Rügen, fighting against the combined Danish and Swedish fleets. The Relations with Denmark. allies shared Norway between them, but the real power lay in the hands of Erik and Svein, sons of Earl Haakon. In 1015, when Erik was absent in England, another descendant of Harald Haarfager appeared, Olaf, the son of Harald Grenske, a great-grandson of Harald Haarfager (see Olaf II. Haraldssön). He defeated Svein at Nesje in 1016, which left him free to work towards a united and Christian Norway. For some years he was successful, but he strained the loyalty of his subjects too far, and on the appearance of Knut the Great in 1029 he fled to Russia. His death at the battle of Stiklestad on his return in 1030 was followed by a few years of Danish rule under Svein Knutssön, which rendered Olaf's memory sweet by contrast, and soon the name of St Olaf came to stand for internal union and freedom from external oppression. In 1035 his young son Magnus, afterwards called the Good, was summoned from Russia, and was readily accepted as king. A treaty was made with Hardeknut which provided that whichever king survived should inherit the other's crown. Hardeknut died in 1042, and Magnus became king of Denmark, but a nephew of Knut the Great, Svein Estridssön, entered into league with Harald Haardraade (see Harald III. ), the half-brother of St Olaf, who had just returned from the East. As soon, however, as overtures were made to him by Magnus, he forsook the cause of Svein, and in 1046 agreed to become joint king of Norway with Magnus. The difficulties arising out of this situation were solved by Magnus's death in 1047. Harald's attempts to win Denmark were vain, and in 1066 he set about a yet more formidable task in attacking England, End of Harald Haarfager's line. which ended with his death at Stamford Bridge in 1066. His son Olaf Kyrre (the Quiet) shared the kingdom with his brother Magnus until the latter's death in 1069, after which the country enjoyed a period of peace. A feature of this reign is the increasing importance of the towns, including Bergen, which was founded by Olaf. In 1093 Olaf was succeeded by his turbulent son Magnus Barfod (barefoot) and by Haakon, son of Magnus the Good. The latter died in 1095. Besides engaging in an unsuccessful war against the Swedish king Inge, in which he was defeated at Foxerne in 1101, Magnus undertook three warlike expeditions to the Scottish isles. It was on the last of these expeditions, in 1103, that he met his death. He was succeeded by his three sons, Eystein, Sigurd and Olaf. Olaf died young. Sigurd undertook a pilgrimage, from which he gained the name of Jorsalfar (traveller to Jerusalem). He won much booty from the Moors in Spain, from pirates in the Mediterranean, and finally at Sidon, which he and his ally Baldwin I. of Jerusalem took and sacked. Eystein died in 1122. Sigurd lived till 1130, but was subject to fits of insanity in his later years. He was the last undoubted representative of Harald Haarfager's race, for on his death his son Magnus was ousted by Harald Gille, or Gilchrist, who professed to be a natural son of Magnus Barfod. Harald Gille was slain in 1136 by another pretender, and anarchy ruled during the reign of his sons Eystein, Inge and Disputed successions. Sigurd Mund. At last Inge's party attacked and killed first Sigurd (1155) and then Eystein (1157). Inge fell in a fight against Sigurd's son Haakon Herdebred in 1161, but a powerful baron, Erling, succeeded in getting his son Magnus made king, on the plea that the boy's maternal grandfather was King Sigurd Jorsalfar. Descent through females was not valid in succession to the throne, and to render his son's position more secure, Erling obtained the support of the Church. In 1164 the archbishop of Trondhjem crowned Magnus, demanding that the crown should be held as a fief of the Norwegian Church. Owing to such concessions the Church was gaining a paramount position, when a new pretender appeared. Sverre (O.N. Sverrir) claimed to be the son of Sigurd Mund, and was adopted as leader by a party known as the Birkebeiner or Birchlegs. He possessed military genius of a rare order, and in spite of help from Denmark, the support of the Church and of the majority of barons, Magnus was defeated time after time, till he met his death at the battle of Nordnes in 1184. The aristocracy could offer little further opposition. In joining hands with the Church against Sverre, the local chiefs had got out of touch with the small landowners, with whose support Sverre was able to build up a powerful monarchy. Sverre's most dangerous opponent was the Church, which offered the most strenuous resistance to his efforts to cut down its prerogatives. The archbishop found support in Denmark, whence he laid his whole see under an interdict, but Sverre's counter-claim of his own divine right as king had much more influence in Norway. Sverre died in 1202, his last years harassed by the rise of the Baglers, or “crozier-men,” with a new claimant at their Magnus. head. His son Haakon III. died two years later, perhaps of poison, but the Birkebeiner party in 1217 succeeded in placing Haakon's son and namesake on the throne (see Haakon IV.). In 1240 the last of the rival claimants fell, and the country began to regain prosperity. The acquisition of Iceland was at length realized. Haakon's death occurred after the battle of Largs in the Orkneys in 1263. The war with Scotland was soon terminated by his son Magnus, who surrendered the Hebrides and the Isle of Man at the treaty of Perth in 1268. Magnus saw the worthlessness of a doubtful suzerainty over islands which had lost their value to Norway since the decay of Viking enterprise. He gained his title of Law-Mender from the revision of the laws, which had remained very much as in heathen days, and which were still different for the four different districts. By 1274 Magnus had secured the acceptance of a revised compilation of the older law-books. The new code repealed all the old wergild laws, and provided that the major part of the fine for manslaughter should be paid to the victim's heir, the remainder to the king. Henceforward the council comes more and more to be composed of the king's court officials, instead of a gathering of the lendermænd or barons of the district in which the king happened to be. During Magnus's reign we hear of a larger council, occasionally called palliment (parliament), which is summoned at the king's wish. The old landed aristocracy had lost its power so completely that even after Magnus's death in 1280 it was unable to reinstate itself during the minority of his son Erik. Erik was succeeded in 1299 by his brother Haakon V., who in 1308 felt himself strong enough to abolish the dignity of the Paralysis of the aristocracy. lendermænd. This paralysis of the aristocracy is no doubt partly to be ascribed to the civil wars, but in part also to the gradual impoverishment of the country, which told especially upon this class. Russia had long eclipsed Norway as the centre of the fur trade, and other industries must have suffered, not only from the civil wars, but also from the supremacy of the Hanseatic towns, which dominated the North, and could dictate their own terms. In earlier times the aristocratic families had owed their wealth to three main sources: commerce, Viking expeditions and slave labour. Trade had been a favourite means of enrichment among the aristocracy up to the middle of the 13th century, but now it was almost monopolized by Germans, and Viking enterprise was a thing of the past. The third source of wealth had also failed, for it is clear from the laws of Magnus that the class of thralls had practically disappeared. This must have greatly contributed to shatter the power of the class which had once been the chief factor in the government of Norway. Reigns of the Kings of Norway. P. A. Munch (5 vols., Christiania, 1846-1895). 1397-1814.—The history of Norway from 1397 down to the union with Sweden in 1814 falls naturally into four divisions. First, in 1450, the triple bond gave place to a union in which Norway became more firmly joined to Denmark. Next, in 1536, as the result of the Reformation, Norway sank almost to the level of a province. After 1660 she gained something in status from the establishment of autocracy in Denmark, and at the close of the period she became a constitutional kingdom on a footing of approximate equality with Sweden. But for the convulsions to which some of these changes gave rise, Norway possesses during this period but little history of her own, and she sank from her former position as a considerable and independent nation. The kings dwelt outside her borders, her fleet and army decayed, and her language gradually 15th century. gave place to Danish. Germans plundered her coasts and monopolized her commerce, and after 1450 Danes began to appropriate the higher posts in her administration. When in 1448 Karl Knutsson was chosen king by the Swedes, and Christian of Oldenburg by the Danes, it was by force that Norway fell to the latter. On the 24th of November 1449 the Norwegians protested against Christian's assumption of sovereignty over them, and against separation from the Swedes. Next year, however, the Swedes assented to the separation. Christian I. (1450-1481) gave estates and offices in Norway to his Danish subjects and raised money by pawning her ancient possessions, the Orkneys and Shetland islands, to the king of Scotland. His son Hans (1482-1513) purchased the obedience of the Norwegian nobles by concessions to their power. The imposing union continued in name, but the weakness of the nation and its government was strikingly illustrated when the Germans in Bergen besieged a monastery in which their enemy Olaf Nilsson, a high official, had taken refuge. After the downfall of Christian II. (1513-1524) the position of Norway in relation to Denmark was changed for the worse. 16th century. She was ruled for a century and a quarter by Danish century officials; the churches and monasteries of Norway were sacked by Danes, and Danes were installed as pastors under the Lutheran system, which the Norwegians were compelled to accept in 1539. Soon Norway was dragged by Denmark into the so-called Seven Years' War of the North (1563-70). However, the power of the Hanse League in Bergen was broken. The rule of the Oldenburg dynasty proved neglectful rather than tyrannical, and under it the mass of the peasants was not flagrantly oppressed. Christian IV. (1588-1648), who founded Christiania, may almost be said to have discovered Norway anew. He reformed its government and strove to develop its resources, but his policy involved Norway in the loss 17th century. of the provinces of Jemtland and Herjedalen, which were ceded to the Swedes by the peace of Brömsebro (1645). The Danish war of revenge against Carl X. of Sweden resulted in further territorial loss by Norway. By the peace of Roskilde (1658) she was compelled to renounce the counties of Trondhjem and Baahus, and although the former was restored by the peace of Copenhagen, two years later, her population fell below half a million. The Swedes had now acquired the rich provinces in the south and south-west of the Scandinavian peninsula, and their ambition to extend their frontiers to the North Sea became more pronounced and more possible of accomplishment. From the middle of the 17th century, however, the Dutch and English made their influence felt, and the political status of Norway could no longer be regarded as a purely Scandinavian affair. The establishment of hereditary autocracy in Denmark by Frederick III. in 1660 conferred many benefits upon Norway. Personal liberty perhaps suffered, but the Norwegian peasant remained a freeman while his counterpart in Denmark was a serf. Norwegian law was revised and codified under Christian V. (1670-1699), who was well served by the Norwegians in his attempt to regain the lost provinces. Under the sons of these monarchs, Frederick IV. and Carl XII., Norway was once more compelled to pay for Danish 18th century. aggression. Her shipping was destroyed, and in 1716, when driven from continental Europe, the Swedish hosts fell upon her. Two years later, however, the death of Carl XII. at the border fortress of Frederikshald averted the danger. During this war Peter Tordenskjold, the greatest among a long series of Norwegian heroes who served in the Danish fleet, won undying fame. Before the close of the 18th century something had been done towards dispelling the intellectual darkness. Holberg, though he flourished outside Norway, was at least born there, and by stemming the tide of German influence he made the future of Norwegian literature possible. At the close of the century Hans Nielson Hauge, the Wesley of Norway, appeared, while the growth of the timber trade with England gave rise to a great increase in wealth and population. In a century and a half the number of the Norwegian people was doubled, so that by 1814 Norway comprised some 900,000 souls. In 1788 the oppressive law that grain should be imported into Norway only from Denmark was repealed, and thanks to Danish policy Norway actually drew financial profit from the wars of the French Revolution. 1814-1907.—After a union of nearly 400 years between Norway and Denmark, the Danish king, Frederick VI., without Events leading to the union with Sweden. consulting the Norwegians, ceded Norway to Sweden by the treaty of Kiel (January 14, 1814). Some time previously Sweden had joined the allies in their their struggle against Napoleon, while Denmark had, unwisely, sided with the French. In 1813 the Swedish crown prince, Bernadotte, afterwards King Carl XIV., proceeded to Germany and took command of one of the armies of the allies. After the power of Napoleon had been broken at the battle of Leipzig, he advanced against Denmark, and King Frederick soon saw himself compelled to accede to the cession of Norway, which had long been the aspiration of the Swedes, especially after the loss of Finland in 1809. In the treaty of Kiel Frederick VI. absolved the Norwegians from their oath of allegiance, and called upon them to become the loyal subjects of the Swedish king. But the Norwegians, who had not been consulted in the matter, refused to acknowledge the treaty, declaring that, while the Danish king might renounce his right to the Norwegian crown, it was contrary to international law to dispose of an entire kingdom without the consent of its people. A meeting of delegates was convened at Eidsvold, not far from the Norwegian capital, where, on the 17th of May 1814, a constitution, framed upon the constitutions of America, of France (1791), and of Spain (1812), was adopted. Among its most important features are that the Storthing, or National Assembly, is a single-chamber institution, and that the king is not given an absolute veto, or the right to dissolve the Storthing. The Danish governor of Norway, Prince Christian Frederick, was unanimously elected king. Soon afterwards the Swedes, under the crown prince, invaded Norway. The hostilities lasted only a fortnight, when Bernadotte opened negotiations with the Norwegians. A convention was held at Moss, where it was proposed that the Norwegians should accept the Swedish king as their sovereign, on the condition that their constitution of the 17th of May should remain intact, except with such alterations as the union might render necessary. An extraordinary Storthing was then summoned at Christiania, and on the 4th of November 1814 Norway was declared to be “a free, independent, and indivisible kingdom, united with Sweden under one king.” A month previously Prince Christian Frederick had laid down his crown and left the country. The union was more fully defined by the “Act of Union,” which was accepted by the national assemblies of both countries in the following year. In the preamble to the act it is clearly stated that the union between the two peoples was accomplished “not by force of arms, but by free conviction,” and the Swedish foreign minister declared to the European Powers, on behalf of Sweden, that the treaty of Kiel had been abandoned, and that it was not to this treaty, but to the confidence of the Norwegian people in the Swedish, that the latter owed the union with Norway. The constitution framed at Eidsvold was retained, and formed the Grundlov, or fundamental law of the kingdom. The union thus concluded between the two countries was really an offensive and defensive alliance under a common king, each country retaining its own government, parliament, army, navy and customs. In Sweden the people received only an imperfect and erroneous insight into the nature of the union, and for a long time believed it to be an achievement of the Swedish arms. They had hoped to make Norway a province of Sweden, and now they had entered into a union in which both countries were equally independent. During the first fifteen years the king was represented in Norway by a Swedish Viceroy, while the government was, of course, composed only of Norwegians. Count Wedel Jarlsberg was the first to be entrusted with the important office of head of the Norwegian government, while several of Prince Christian Frederick's councillors of state were retained, or replaced by others holding their political views. The Swedish Count von Essen was appointed the first viceroy of Norway, and was succeeded two years afterwards by his countryman Count von Mörner, over both of whom Count Wedel exercised considerable influence. During the first years of the union the country suffered from poverty and depression of trade, and the finances were in a Strained relations between king and Storthing. deplorable condition. The first Storthing was chiefly occupied with financial and other practical measures. In order to improve the finances of the country a bank of Norway was founded, and the army was reduced to one half. The paid-up capital of the bank was procured by an extraordinary tax, and this, together with the growing discontent among the peasantry, brought about a rising in Hedemarken, the object of which was to dissolve the Storthing and to obtain a reduction in the taxation. The rising, however, soon subsided, and the bountiful harvest of 1819 brought more prosperous times to the peasantry. Meanwhile, however, the financial position of the country had nearly endangered its independence. The settlement with Denmark with regard to Norway's share of the national debt common to both, assumed threatening proportions. In the interest of Denmark, the allied powers asked for a speedy settlement, and in order to escape their collective intervention, Bernadotte, who had now succeeded to the throne of Sweden and Norway, on the death (February 5, 1818) of the old king Carl XIII., accepted England's mediation, and was enabled in September 1819 to conclude a convention with Denmark, according to which Norway was held liable for only 3,000,000 specie dollars (nearly £700,000). But the Norwegians considered that this was still too much, and the attitude of the Storthing in 1821 nearly occasioned a fresh interference of the powers. The Storthing, however, yielded at last, and agreed to raise a loan and pay the amount stipulated in the convention, but the king evidently had his doubts as to whether the Norwegians really intended to fulfil their obligations. As his relations with the Storthing had already become strained, and as he was occupied at that time with plans, which it is now known meant nothing less than a coup d'état in connexion with the revision of the Norwegian constitution, he decided to adopt military preparations, and in July 1821 he collected a force of 3000 Swedish and 3000 Norwegian troops in the neighbourhood of Christiania, ostensibly for the mere purpose of holding some manœuvres. In a circular note (June 1) to the European powers, signed by the Swedish foreign minister, Engström—but it is not difficult to recognize the hand of the king as the real author—the minister complained bitterly of the treatment the king had met with at the hands of the Storthing, and represented the Norwegians in anything but a favourable light to the powers, the intention being to obtain their sympathy for any attempt that might be made to revise the Norwegian constitution. About this time another important question had to be settled by the Storthing. The Storthings of 1815 and 1818 had already passed a bill for the abolition of nobility, but the king had on both occasions refused his sanction. The Norwegians maintained that the few counts and barons still to be found in Norway were all Danish and of very recent origin, while the really true and ancient nobility of the country were the Norwegian peasants, descendants of the old jarls and chieftains. According to the constitution, any bill which has been passed by three successively elected Storthings, elections being held every third year, becomes law without the king's sanction. When the third reading of the bill came on, the king did everything in his power to obstruct it, but in spite of his opposition the bill was eventually carried and became law. In 1822 Count Wedel Jarlsberg retired from the government. He had become unpopular through his financial policy, and Royal proposals for constitutional revision. was also at issue with the king on vital matters. In 1821 he had been impeached before the Rigsret, the supreme court of the realm, for having caused the state considerable losses. Jonas Collett(1772-1851) was appointed as his successor to the post of minister of finance. The king had by this time apparently abandoned his plan of a coup d'état, for in the following August he submitted to the Storthing several proposals for fundamental changes in the constitution, all of which aimed at removing all that was at variance with a monarchical form of government. The changes, in fact, were the same as he had suggested in his circular note to the Powers, and which he knew would be hailed with approval by his Swedish subjects. When the Storthing met again in 1824 the royal proposals for the constitutional changes came on for discussion. The Storthing unanimously rejected not only the king's proposals, but also several others by private members for changes in the constitution. The king submitted his proposals again in the following session of the Storthing, and again later on, but they were always unanimously rejected. In 1830 they were discussed for the last time, with the same result. The king's insistence was viewed by the people as a sign of absolutist tendencies, and naturally excited fresh alarm. In the eyes of the people the members of the opposition in the Storthing were the true champions of the rights and the independence which they had gained in 1814. For several years the Norwegians had been celebrating the 17th of May as their day of independence, it being the anniversary The king's absolutist tendencies. of the adoption of the constitution of 1814; but as the tension between the Norwegians and the king increased, the latter began to look upon the celebration in the light of a demonstration directed against himself, and when Collett, the minister of finance, was impeached before the supreme court of the realm for having made certain payments without the sanction of the Storthing, he also considered this as an attack upon his royal prerogatives. His irritation knew no bounds, and although Collett was acquitted by the supreme court, the king, in order to express his irritation with the Storthing and the action they had taken against one of his ministers, dissolved the national assembly with every sign of displeasure. The Swedish Viceroy at the time, Count Sandels, had tried to convince him that his prejudice against the celebration of the 17th of May was groundless, and for some years the king had made no objection to the celebration. In 1827 it was, however, celebrated in a very marked manner, and later in the same year there was a demonstration against a foolish political play called The Union, and this being privately reported to the king in as bad a light as possible, he thought that Count Sandels, who had not considered it worth while to report the occurrence, was not fitted for his post, and had him replaced by Count Beltzar Bojilaus Platen (1766-1829), an upright but narrow-minded statesman. Count Platen's first act was to issue a proclamation warning the people against celebrating the day of independence; and in April 1828 the king, against the advice of his ministers, summoned an extraordinary Storthing, his intention being to wrest from the Storthing the supremacy it had gained in 1827. He also intended to take steps to prevent the celebration of the 17th of May, and assembled a force of 2000 Norwegian soldiers in the neighbourhood of the capital. The king arrived in Christiania soon after the opening of the extraordinary Storthing. He did not succeed, however, in his attempt to make any constitutional changes, but the Storthing met the king's wishes with regard to the celebration of the 17th of May by deciding not to continue the celebration, and the people all over the country quietly acquiesced. The following year trouble broke out again. The students had decided to celebrate the 17th of May with a festive gathering, which, however, passed off quietly. But large masses of the people paraded the streets, singing and shouting, and gathered finally in the market-place. There was a little rioting, The “battle of the market-place.” and the police and the military eventually dispersed the people and drove them to their homes with sword and musket. This episode has become known as the “battle of the market-place,” and did much to increase the general ill-feeling against Count Platen. His health eventually broke down from disappointment and vexation at the indignities and abuse heaped upon him. He died in Christiania at the end of the year, and his post remained vacant for several years, the presidency of the Norwegian government in the-meantime being taken by Collett, its oldest member. By the July Revolution of 1830 the political situation in Europe became completely changed, and the lessons derived Increased political power of the peasantry. from that great movement reached also to Norway. The representatives of the peasantry, for whom the constitution had paved the way to become the ruling element in political life, were also beginning to distinguish themselves in the national assembly, where they now had taken up an independent position against the representatives of the official classes, who in 1814 and afterwards had played the leading and most influential part in politics. This party was now under the leadership of the able and gifted Ole Ueland, who remained a member of every Storthing from 1833 to 1869. The Storthing of 1833 was the first of the so-called “peasant Storthings.” Hitherto the peasantry had never been represented by more than twenty members, but the elections in 1833 brought their number up to forty-five, nearly half of the total representation. The attention of this new party was especially directed to the finances of the country, in the administration of which they demanded the strictest economy. They often went too far in their zeal, and thereby incurred considerable ridicule. About this time the peasant party found a champion in the youthful poet Henrik Wergeland, who soon became one of the Wergeland opposed by Welhaven. leaders of the “Young Norway” party. He was a republican in politics, and the most zealous upholder of the national independence of Norway and of her full equality with Sweden in the union. A strong opposition to Wergeland and the peasant party was formed by the upper classes under the leadership of another rising poet and writer, Johan Sebastian Welhaven, and other talented men, who wished to retain the literary and linguistic relationship with Denmark, while Wergeland and his party wished to make the separation from Denmark as complete as possible, and in every way to encourage the growth of the national characteristics and feeling among the people. He devoted much of his time, by writing and other means, to promote the education of the people; but although he was most popular with the working and poorer classes, he was not able to form any political party around him, and at the time of his death he stood almost isolated. He died in 1845, and his opponents became now the leaders in the field of literature, and carried on the work of national reconstruction in a more restrained and quiet manner. The peasant party still continued to exist, but restricted itself principally to the assertion of local interests and the maintenance of strict economy in finance. The violent agitation that began in 1830 died away. The tension between the king and the legislature, however, still continued, and reached its height during the session of 1836, when all the royal proposals for changes in the constitution were laid aside, without even passing through committee, and when various other steps towards upholding the independence of the country were taken. The king, in his displeasure, decided to dissolve the Storthing; but before it dispersed it proceeded to impeach Lövenskiold, one of the ministers, before the supreme court of the realm, for having advised the king to dissolve the Storthing. He was eventually sentenced to pay a fine of 10,000 kroner (about £550), but he retained his post. Collett, another minister who had greatly displeased the king by his conduct, was dismissed; but unity in the government was brought about by the appointment of Count Wedel Jarlsberg as viceroy of Norway. From this time the relations between the king and the Norwegian people began to improve, whereas in Sweden he was, in his later years, not a little disliked. When the king's anger had subsided, he summoned the Storthing to an extraordinary session, during which several important The national flag question. bills were passed. Towards the close of the session an address to the king was agreed to, in which the Storthing urged that steps should be taken to place Norway in political respects upon an equal footing with Sweden, especially in the conduct of diplomatic affairs with foreign countries. The same address contained a petition for the use of the national or merchant flag in all waters. According to the constitution, Norway was to have her own merchant flag, and in 1821 the Storthing had passed a resolution that the flag should be scarlet, divided into four by a blue cross with white borders. The king, however, refused his sanction to the resolution, but gave permission to use the flag in waters nearer home; but beyond Cape Finisterre the naval flag, which was really the Swedish flag, with a white cross on a red ground in the upper square, must be carried. In reply to the Storthing's address the king in 1838 conceded the right to all merchant ships to carry the national flag in all waters. This was hailed with great rejoicings all over the country; but the question of the national flag for general use had yet to be settled. With regard to the question raised in the address of the Storthing about the conduct of diplomatic affairs, and other matters concerning the equality of Norway in the union, the king in 1839 appointed a committee of four Norwegians and four Swedes, who were to consider and report upon the questions thus raised. During the sitting of this first “Union Committee” its powers were extended to consider a comprehensive revision of the Act Death of King Carl Johan; succeeded by Oscar I. of Union, with the limitation that the fundamental conditions of the union must in no way be interfered with. But before the committee had finished their report the king died (March 8th 1844), and was succeeded by his son Oscar I. According to the constitution the Norwegian kings must be crowned in Throndhjem cathedral, but the bishop of Throndhjem was in doubt whether the queen, who was a Roman Catholic, could be crowned, and the king decided to forego the coronation both of himself and his queen. The new king soon showed his desire to meet the wishes of the Norwegian people. Thus he decided that in all documents concerning the internal government of the country Norway should stand first where reference was made to the king as sovereign of the two kingdoms. After having received the report of the committee concerning the flag question, he resolved (June 20th, 1844) that Norway and Sweden should each carry its own national flag as the naval flag, with the mark of union in the upper corner; and it was also decided that the merchant flag of the two kingdoms should bear the same mark of union, and that only ships sailing under these flags could claim the protection of the state. The financial and material condition of the country had now considerably improved, and King Oscar's reign was marked by the carrying out of important legislative work and reforms, especially in local government. New roads were planned and built all over the country, the first railway was built, steamship routes along the coast were established, lighthouses were erected and trade and shipping made great progress. The king's reign was not disturbed by any serious conflicts between the two countries. No change took place in the ministry under the presidency of the Viceroy Lövenskiold upon King Oscar's accession to the throne, but on the death or retirement of some of its members the vacant places were filled by younger and talented men, among whom was Fredrik Stang, who in 1845 took over the newly established ministry of the interior. During the Schleswig-Holstein rebellion (1848-1850) and the Crimean War King Oscar succeeded in maintaining the neutrality of Norway and Sweden, by which Norwegian shipping especially benefited. The abolition of the English navigation acts in 1850 was of great importance to Norway, and opened up a great future for its merchant fleet. In 1826 a treaty had been concluded with Russia, by which the frontier between that country and the adjoining strip of Relations with Russia. Norwegian territory in the Polar region was definitely delimited; but in spite of this treaty Russia in 1851 demanded that the Russian Lapps on the Norwegian frontier should have the right to fish on the Norwegian coast, and have a portion of the coast on the Varanger fjord allotted to them to settle upon. The Norwegian government refused to accede to the Russian demands, and serious complications might have ensued if the attention of Russia had not been turned in another direction. While his father had looked to Russia for support, King Oscar was more inclined to secure western powers as his allies, and during the Crimean War he concluded a treaty with England and France, according to which these countries promised their assistance in the event of any fresh attempts at encroachment on Norwegian or Swedish territory by Russia. In consequence of this treaty the relations between Norway and Sweden and Russia became somewhat strained; but after the peace of Paris in 1856, and the accession of Alexander II., whose government was in favour of a peaceful policy, the Russian ambassador at Stockholm succeeded in bringing about more friendly relations. Owing to the king's ill-health, his son, the crown prince Carl, was appointed regent in 1857, and two years later, when King Oscar died, he succeeded to the thrones of the two countries as Carl XV. He was a gifted, genial and noble personality, and Death of Oscar I.; accession of Carl XV. desired to inaugurate his reign by giving the Norwegians a proof of his willingness to acknowledge the claims of Norway, but he did not live to see his wishes in this respect carried out. According to the constitution, the king had the power to appoint a viceroy for Norway, who might be either a Norwegian or Swede. Since 1829 no Swede had held the post, and since 1859 no appointment of a viceroy had been made. But the paragraph in the constitution still existed, and the Norwegians naturally wished to have this stamp of “provinciality” obliterated. A proposal for the Question of Norwegian viceroy. abolishment of the office of viceroy was laid before the Storthing in 1859, and passed by it. The king, whose sympathies on this question were known, had been appealed to, and had privately promised that he would sanction the proposed change in the constitution; but as soon as the resolution of the Storthing became known in Sweden, a violent outcry arose both in the Swedish press and the Swedish estates. Under the pressure that was brought to bear upon the king in Sweden, he eventually refused to sanction the resolution of the Storthing; but he added that he shared the views of his Norwegian counsellors, and would, when “the convenient moment” came, himself propose the abolition of the office of viceroy. In the following year the Swedish government again pressed the demands of the Swedish estates for a revision of the Act of Union, Swedish proposals for revision of Act of Union. which this time included the establishment of a union or common parliament for the two countries, on the basis that, according to the population, there should be two Swedish members to every Norwegian. The proposal was sent to the Norwegian government, which did not seem at all disposed to entertain it; but some dissensions arose with regard to the form in which its reply was to be laid before the king. The more obstinate members of the ministry resigned, and others, of a more pliable nature, were appointed under the presidency of Fredrik Stang, who had already been minister of the interior from 1845 to 1856. The reconstructed government was, however, in accord with the retiring one, that no proposal for the revision of the Act of Union could then be entertained. The king, however, advocated the desirability of a revision, but insisted that this would have to be based upon the full equality of both countries. In 1863 the Storthing assented to the appointment by the king of a Union committee, the second time that such a committee had been called upon to consider this vexatious question. It was not until 1867 that its report was made public, but it could not come on for discussion in the Storthing till it met again in 1871. During this period the differences between the two countries were somewhat thrust into the background by the Danish complications in 1863-1864, which threatened to draw the two kingdoms into war. King Carl was himself in favour of a defensive alliance with Denmark, but the Norwegian Storthing would only consent to this if an alliance could also be effected with at least one of the western powers. In 1869 the Storthing passed a resolution by which its sessions were made annual instead of triennial according to the constitution of 1814. The first important question which the first yearly Storthing which met in 1871 had to consider was once more the proposed revision of the Act of Union. The Norwegians had persistently maintained that in any discussion on this question the basis for the negotiations should be (1) the full equality of the two kingdoms, and (2) no extension of the bonds of the union beyond the line originally defined in the act of 1815. However, the draft of the new act contained terms in which the supremacy of Sweden was presupposed and which introduced important extensions of the bonds of the union; and, strangely enough, the report of the Union committee was adopted by the new Stang ministry, and even supported by some of the most influential newspapers under the plausible garb of “Scandinavianism.” In these circumstances the “lawyers' party,” under the leadership of Johan Sverdrup, who was to play such a prominent part in Norwegian politics, and the “peasant party,” led by Sören Jaabœk, a gifted peasant proprietor, who was also destined to become a prominent figure in the political history of the country, Foundation of the Norwegian national party. formed an alliance, with the object of guarding against any encroachment upon the liberty and independence which the country had secured by the constitution of 1814. This was the foundation of the great national party, which became known as the “Venstre” (the left), and which before long became powerful enough to exert the most decisive influence upon the political affairs of the country. When, therefore, the proposed revision of the Act of Union eventually came before the Storthing in 1871, it was rejected by an overwhelming majority. The position which the government had taken up on this question helped to open the eyes of the Norwegians to some defects in the constitution, which had proved obstacles to the development and strengthening of the parliamentary system. In 1872 a private bill came before the Storthing, proposing that the ministers should be admitted to the Storthing and take part Question of admittance of ministers to seats in the Storthing. in its proceedings. After a number of stormy debates the bill was successfully carried under the leadership of Johan Sverdrup by a large majority, but the government, evidently jealous of the growing powers and influence of the new liberal party in the Storthing, advised the king to refuse his sanction, although the government party itself had several times in the preceding half-century introduced a similar bill for admitting the ministers to the Storthing. At that time, however, the opposition had looked with suspicion on the presence of the ministers in the national assembly, lest their superior skill in debate and political experience should turn the scale too readily in favour of government measures. Now, on the contrary, the opposition had gained more experience and had confidence in its own strength, and no doubt found that the legislative work could better be carried on if the ministers were present to explain and defend their views; but the government saw in the proposed reform the threatened introduction of full parliamentary government, by which the ministry could not remain in office unless supported by a majority in the Storthing. Before the Storthing separated the liberals carried a vote of censure against the government; but the king declared that the ministers enjoyed his confidence and took no further notice of the vote. Two of the ministers, who had advised the ratification of the bill, resigned, however; and a third minister, who had been in the government since 1848, resigned also, and retired from public life, foreseeing the storm that was brewing on the political horizon. Numerous public meetings were held all over the country in support of the proposed reform, and among the speakers was Johan Sverdrup, now the acknowledged leader of the liberal party, who was hailed with great enthusiasm as the champion of the proposed reform. This was the political situation when King Carl died (18th September 1872). He was succeeded by his brother who ascended Death of Carl XV. ; accession of Oscar II. the throne as Oscar II. In the following year he gave his sanction to the bill for the abolition of the office of viceroy, which the Storthing had again passed, and the president of the ministry was afterwards recognized as the prime minister and head of the government in Christiania. Fredrik Stang, who was the president of the ministry at the time, was the first to fill this office. In the same year Norway celebrated its existence for a thousand years as a kingdom, with great festivities. In 1874 the government, in order to show the people that they to some extent were willing to meet their wishes with regard to Proposals by the Storthing for full popular control. the great question before the country, laid before the Storthing a royal proposition for the admittance of the ministers to the national assembly. But this was to be accompanied by certain other constitutional changes, such as giving the king the right of dissolving the Storthing at his pleasure and providing fixed pensions for ex-ministers, which was regarded as a guarantee against the majority of the assembly misusing its new power. The bill which the government brought in was unanimously rejected by the Storthing, the conservatives also voting against it, as they considered the guarantees insufficient. The same year, and again in 1877, the Storthing passed the bill, but in a somewhat different form from that of 1872. On both occasions the king refused his sanction. The Storthing then resorted to the procedure provided by the constitution to carry out the people's will. In 1880 the bill was The king's veto. passed for the third time, and on this occasion by the overwhelming majority of 93 out of 113. Three Storthings after three successive elections had now carried the bill, and it was generally expected that the king and his government would at length comply with the wishes of the people, but the king on this occasion also refused his sanction, declaring at the same time that his right to the absolute veto was “above all doubt.” Johan Sverdrup, the leader of the liberal party and president of the Storthing, brought the question to a prompt issue by proposing to the Storthing that the bill, which had been passed three times, should be declared to be the law of the land without the king's sanction. This proposal was carried by a large majority on the 9th of June 1880, but the king and his ministers in reply declared that they would not recognize the validity of the resolution. From this moment the struggle may be said to have centred itself upon the existence or non-existence of an absolute veto on Struggle between the king and the Storthing. the part of the crown. The king requested the faculty of law at the Christiania university to give its opinion on the question at issue, and with one dissentient the learned doctors upheld the king's right to the absolute veto in questions concerning amendments of the constitution, although they could not find that it was expressly stated in the fundamental law of the country. The ministry also advised the king to claim a veto in questions of supply, which still further increased the ill-feeling in the country against the government, and the conflict in consequence grew more and more violent. In the midst of the struggle between the king and the Storthing, the prime minister, Fredrik Stang, resigned, and Christian Elections of 1882. August Selmer (1816-1889) became his successor; and this, together with the appointment of another member to the ministry, K. H. Schweigaard, plainly indicated that the conflict with the Storthing was to be continued. In June 1882 the king arrived in Christiania to dissolve the Storthing, and on this occasion delivered a speech from the throne, in which he openly censured the representatives of the people for their attitude in legislative work and on the question of the absolute veto, the speech creating considerable surprise throughout the country. Johan Sverdrup and Björnstjerne Björnson, the popular poet and dramatist, called upon the people to support the Storthing in upholding the resolution of the 9th of June, and to rouse themselves to a sense of their political rights. The elections resulted in a great victory for the liberal party, which returned stronger than ever to the Storthing, numbering 83 and the conservatives only 31. The ministry, however, showed no sign of yielding, and, when the new Storthing met in February 1883, the Odelsthing (the lower division of the Impeachment of ministers by the Storthing, 1883. national assembly) decided upon having the question finally settled by impeaching the whole of the ministry before the Rigsret or the supreme court of the realm. The jurisdiction of the Rigsret is limited to the trial of offences against the state, and there is no appeal against its decisions. The charges against the ministers were for having acted contrary to the interests of the country by advising the king to refuse his sanction—first, to the amendment of the law for admitting the ministers to the Storthing; secondly, to a bill involving a question of supply; and thirdly, to a bill by which the Storthing could appoint additional directors on the state railways. The trial of the eleven ministers of the Selmer cabinet began in The ministry sentenced by the Rigsret. May 1883 and lasted over ten months. In the end the Rigsret sentenced the prime minister and seven of his ministers to be deprived of their offices, while three, who had either recommended the king to sanction the bill for admitting the ministers to the Storthing, or had entered the cabinet at a later date, were heavily fined. The excitement in the country rose to feverish anxiety. Rumours of all kinds were afloat, and it was generally believed that the king would attempt a coup d'état. Fortunately the king after some hesitation issued (11th March 1884) an order in council announcing that the judgment of the supreme court would be carried into effect, and Selmer was then called upon to resign his position as Acquiescence by the king. prime minister. King Oscar, however, in his declaration upheld the constitutional prerogative of the crown, which, he maintained, was not impaired by the judgment of the Rigsret. The following month the king, regardless of the large liberal majority in the Storthing, asked Schweigaard, one of the late ministers, whose punishment consisted in a fine, to form a ministry, and the so-called “April ministry” was then appointed, but sent in its resignation in the following month. Professor Broch, a former minister, next failed to form a ministry, and the king was at last compelled to appoint a ministry in accordance with the majority in the First Liberal ministry 1884. Storthing. In June 1884 Johan Sverdrup was asked to form one. He selected for his ministers leading men on the liberal side in the Storthing, and the first liberal ministry that Norway had was at length appointed. The Storthing, in order to satisfy the king, passed a new resolution admitting the ministers to the national assembly, and this received formal sanction. During the following years a series of important reforms was carried through. Thus in 1887 the jury system in criminal matters was introduced into the country after violent opposition from the conservatives. A bill intended to give parishioners greater influence in church matters, and introduced by Jakob Sverdrup, the minister of education, and a nephew of the prime minister, met, however, with strong opposition, and was eventually rejected by the Storthing, the result being a break-up of the ministry and a disorganization of the liberal party. In June 1889 the Sverdrup ministry resigned, and a conservative one was formed by Emil Stang, the leader of the conservatives in the Storthing, and during the next two years the Storthing passed various useful measures; but the ministry was eventually wrecked on the rock of the great national question which about this time came to the front—that of Norway's share in the transaction of diplomatic affairs. At the time of the union in 1814 nothing had been settled as to how these were to be conducted, but in 1835 a resolution was issued, that when the The question of diplomatic representation. Swedish foreign minister was transacting diplomatic matters with the king which concerned both countries, or Norway only, the Norwegian minister of state in attendance upon the king at Stockholm should be present. This arrangement did not always prove satisfactory to the Norwegians, especially as the Swedish foreign minister could not be held responsible to the Norwegian government or parliament. By a change in the Swedish constitution in 1885 the ministerial council, in which diplomatic matters are discussed, came to The Norwegian claim. consist of the Swedish foreign minister and two other members of the cabinet on behalf of Sweden, and of the Norwegian minister at Stockholm on behalf of Norway. The king, wishing to remedy this disparity, proposed that the composition of the council should be determined by an additional paragraph in the Act of Union. The representatives of the Norwegian government in Stockholm proposed that three members of the cabinet of each country should constitute the ministerial council. To this the Swedish government was willing to agree, but on the assumption that the minister of foreign affairs should continue to be a Swede as before, and this the Norwegians, of course, would not accept. At the king's instigation the negotiations with the Swedish government were resumed at the beginning of 1891, but the Swedish Riksdag rejected the proposals, while the Norwegian Storthing insisted upon “Norway's right, as an independent kingdom, to full equality in the union, and therewith her right to watch over her foreign affairs in a constitutional manner.” The Stang ministry then resigned, and a liberal ministry, with Steen, the recognized leader of the liberal party after Sverdrup's withdrawal from politics, as prime minister, was appointed. The new ministry had placed the question of a separate minister of foreign affairs for Norway prominently in their programme, but Question of separate consular service. little progress was made during the next few years. Another and more important question for the country, as far as its shipping and commerce are concerned, now came to the front. The Storthing had in 1891 appointed a committee to inquire into the practicability of establishing a separate Norwegian consular service, and in 1892 the Storthing, acting upon the committee's report, determined to establish a consular service. The king, influenced by public opinion in Sweden, refused his sanction, and the Norwegian government in consequence sent in their resignation, whereupon a complete deadlock ensued. This was terminated by a compromise to the effect that the ministry would return to office on the understanding that the question was postponed by common consent. The following year the Storthing again passed a resolution calling upon the Norwegian government to proceed with the necessary measures for establishing the proposed consular service for Norway, but the king again refused to take any action in the matter. Upon this the liberal ministry resigned (May 1893), and the king appointed a conservative government, with Emil Stang as its chief. Thus matters went on till the end of 1894, when the triennial elections took place, with the result that the majority of the electors declared in favour of national independence on the great question then before the country. The ministry did not at once resign, but waited till the king arrived in Christiania to open the Storthing (January 1895). The king kept the country for over four months without a responsible government, during which time the crisis had become more acute than ever. A coalition ministry was at last formed, with Professor G. F. Hagerup as prime minister. A new committee, consisting of an equal number of Norwegians and Swedes, was appointed to consider the question of separate diplomatic representation; but after sitting for over two years the committee separated without being able to come to any agreement. The elections in 1897 proved again a great victory for the liberal party, 79 liberals and 35 conservatives being returned, and in February 1898 the Hagerup ministry was replaced by a liberal, once more under the premiership of Steen. Soon afterwards the bill for the general adoption of the national or “pure” flag, as it was called, was carried for the third time, and became law without the king's sanction. In 1898 universal political suffrage for men was passed by a large majority, but the proposal to include women received the support of only 33 votes. In January 1902, on the initiative of the Swedish foreign minister, another committee, consisting of an equal number of The crisis of 1902-1905. leading Norwegians and Swedes, was appointed by the king to investigate the consular question. The unanimous report of the committee was to the effect that “it was possible to appoint separate Norwegian consuls exclusively responsible to Norwegian authority and separate Swedish consuls exclusively responsible to Swedish authority.” The further negotiations between the two governments resulted in the so-called communiqué of the 24th of March 1903, which announced the conclusion of an agreement between the representatives of the two countries for the establishment of the separate consular service. The terms of the communiqué were submitted to a combined Norwegian and Swedish council of state on the 21st of December 1903, when they were unanimously agreed to and were signed by the king, who commissioned the Norwegian and the Swedish governments to proceed with the drafting of the laws and regulations for the separate consular services. In due course the Norwegian government submitted to the Swedish government their draft of the proposed laws and regulations, but no reply was forthcoming for several months. About this time the Swedish foreign minister, Mr Lagerheim, who had zealously worked for a friendly solution of the consular question, resigned, and in November the same year Boström, the Swedish prime minister, suddenly submitted to the Norwegian government a number of new conditions under which the Swedish government was prepared to agree to the establishment of separate consuls. This came as a surprise to the Norwegians in view of the fact that the basis for the establishment of separate consuls had already been agreed upon and confirmed by the king in December 1903. According to Boström's proposals the Norwegian consuls were to be placed under the control of the Swedish foreign minister, who was to have the power to remove any Norwegian consul. The Norwegians felt it would be beneath the dignity of a self-governing country to agree to the Swedish proposals, and that these new demands were nothing less than a breach of faith with regard to the terms of agreement arrived at two years before by both governments and approved and signed by the king. The Norwegian government would have been perfectly justified if, after this, they had withdrawn from the negotiations, but they did not wish to jeopardize the opportunity of arriving at a friendly settlement, and Hagerup, the Norwegian prime minister, proceeded to Stockholm to confer with Boström; but no satisfactory agreement could be arrived at. There was therefore nothing left but for the Norwegians to take matters into their own hands. On the 8th of February 1905 Hagerup announced to the Norwegian Storthing that the negotiations had fallen through, and on the 17th the Storthing decided unanimously to refer the matter to a special committee. Owing to some difference of opinion between the members of his ministry, Hagerup resigned on the 1st of March and was succeeded by Christian Michelsen, who formed a ministry composed of members of both political parties. The special committee decided that a bill should be immediately submitted to the Storthing for the establishment of a Norwegian consular service and that the measure should come into force not later than the 1st of April 1906. An attempt was made by the Swedish crown prince, acting as Prince Regent during the king's illness, to enter into new negotiations with the Norwegian government, but the proposals were not favourably received in Norway. In April 1905 Boström resigned, which was considered to be a move on the part of Sweden to facilitate negotiations with Norway. The bill for the establishment of Norwegian consuls was passed by the Storthing without a dissentient voice on the 23rd of May, and it was generally expected that the king, who again had assumed the reins of government, would sanction the bill, but on the 27th of May, in spite of the earnest entreaties of his Norwegian ministers, the king formally refused to do so. The Norwegian Ministry immediately resigned, but the king informed the ministers that Declaration of Independence. he could not accept their resignation. They, however, declined to withdraw it. A few days afterwards the Norwegian government informed the Storthing of the king's refusal, whereupon the assembly unanimously agreed to refer the matter to the special committee. On the 7th of June the Storthing met to hear the final decision of the government. Michelsen, the prime minister, informed the Storthing that all the members of the government had resigned in consequence of the king's refusal to sanction the consular law, that the king had declined to accept the resignation, and that, as an alternative government could not be formed, the union with Sweden, based upon a king in common, was consequently dissolved. The president of the Storthing submitted a resolution that the resigning ministry should be authorized to exercise the authority vested in the king in accordance with the constitution of the country. The resolution was unanimously adopted. King Oscar, on receiving the news of the action of the Norwegian Storthing, sent a telegraphic protest to the Norwegian Separation from Sweden. prime minister and to the president of the Storthing. The Swedish government immediately decided to summon an extraordinary session of the Swedish parliament for the 20th of June, when a special committee was appointed to consider what steps should be taken by Sweden. On the 25th of July the report of the committee was laid before the Riksdag, in which it was stated that Sweden could have no objection to enter into negotiations about the severance of the union, when a vote to that effect had been given by a newly-elected Storthing or by a national vote in the form of a referendum by the Norwegian people. The report was unanimously adopted by the Swedish Riksdag on the 27th of July, and on the following day the Norwegian Storthing decided that a general plebiscite should be taken on the 13th of August, when 368,211 voted in favour of the dissolution and only 184 against it. It was thereupon agreed that representatives of Norway and of Sweden should meet at Karlstad in Sweden on the 31st of August to discuss and arrange for the severance of the union. The negotiations lasted till the 23rd of September, though more than once they were on the point of being broken off. The agreement stipulated a neutral zone on both sides of the southern border between the two countries, the Norwegians undertaking to dismantle some fortifications within that zone. The agreement was to remain in force for ten years, and could be renewed for a similar period, unless one of the countries gave Election of Haakon VII. notice to the contrary. The Karlstad agreement was ratified by the Norwegian Storthing on the 9th of October and by the Swedish Riksdag on the 16th of the same month. On the 27th of October King Oscar issued a proclamation to the Norwegian Storthing, in which he relinquished the crown of Norway. The Norwegian government was thereupon authorized by the Storthing to negotiate with Prince Charles of Denmark and to arrange for a national vote as to whether or no the country would approve of his election for the Norwegian throne. The plebiscite resulted in 259,563 votes for his election and 69,264 against. On the 18th of November the Storthing unanimously elected Prince Charles as king of Norway, he taking the name of Haakon VII. On the 25th of November the king and his consort, Queen Maud, the youngest daughter of King Edward VII. of England, entered the Norwegian capital. Their coronation took place in the Trondhjem cathedral the following year. The modern literature of Norway bears something of the same relation to that of Denmark that American literature bears to English. In each case the development and separation of a dependency have produced a desire on the part of persons speaking the mother-tongue for a literature that shall express the local emotions and conditions of the new nation. Two notable events led to the foundation of a separate Norwegian literature: the one was the creation of the university of Christiania in 1811, and the other was the separation of Norway from Denmark in 1814. Before this time Norwegian writers had been content, as a rule, to publish their works at Copenhagen. The first name on the annals of Danish literature, Peder Clausen, is that of a Norwegian; and if all Norse writers were removed from that roll, the list would be poorer by some of its most illustrious names, by Holberg, Tullin, Wessel, Treschow, Steffens and Hauch. The first book printed in Norway was an almanac, brought out in Christiania in 1643 by a wandering printer named Tyge Nielsen, who brought his types from Copenhagen. But the first press set up definitely in Norway was that of Valentin Kuhn, brought over from Germany in 1650 by the theologian Christian Stephensen Bang (1580-1678) to help in the circulation of his numerous tracts. Bang's Christianiae Stads Beskrifuelse (1651), is the first book published in Norway. Christen Jensen (d. 1653) was a priest who collected a small glossary or glosebog of the local dialects, published in 1656. Gerhard Milzow (1629-1688), the author of a Presbyterologia Norwegica (1679), was also a Norse priest. The earliest Norwegian writer of any original merit was Dorthe Engelbrechtsdatter (1634-1716), afterwards the wife of the pastor Ambrosius Hardenbech. She is the author of several volumes of religious poetry which have enjoyed great popularity. The hymn-writer Johan Brunsmann (1637-1707), though a Norseman by birth, belongs by education and temper entirely to Denmark. Not so Petter Dass (1647-1708) (q.v. ), the most original writer whom Norway produced and retained at home during the period of annexation. Another priest, Jonas Ramus (1649-1718), wrote Norriges Kongers Historie (History of the Norse Kings) in 1719, and Norriges Beskrivelse (1735). The celebrated missionary to Greenland, Hans Egede (1686-1758), wrote several works on his experiences in that country. Peder Hersleb (1689-1757) was the compiler of some popular treatises of Lutheran theology. Frederik Nannestad, bishop of Trondhjem (1693-1774), started a weekly gazette in 1760. The missionary Knud Leem (1697-1774) published a number of works on the Lapps of Finmark, one at least of which, his Beskrivelse over Finmarkens Lapper (1767), still possesses considerable interest. The famous Erik Pontoppidan (1698-1764) cannot be regarded as a Norwegian, for he did not leave Denmark until he was made bishop of Bergen, at the age of forty-nine. On the other hand the far more famous Baron Ludvig Holberg (1684-1754), belongs to Denmark by everything but birth, having left Norway in childhood. A few Norsemen of the beginning of the 18th century distinguished themselves chiefly in science. Of these Johan Ernst Gunnerus (1718-1773), bishop of Trondhjem, was the first man who gave close attention to the Norwegian flora. He founded the Norwegian Royal Society of Sciences in 1760, with Gerhard Schöning (1722-1780) the historian and Hans Strom (1726-1797) the zoologist. Peder Christofer Stenersen (1723-1776), a writer of occasional verses, merely led the way for Christian Braumann Tullin (1728-1765), a lyrical poet of exquisite genius, who is claimed by Denmark but who must be mentioned here, because his poetry was not only mainly composed in Christiania, but breathes a local spirit. Danish literature between the great names of Evald and Baggesen presents us with hardly a single figure which is not that of a Norseman. The director of the Danish national theatre in 1771 was a Norwegian, Niels Krog Bredal (1733-1778), who was the first to write lyrical dramas in Danish. A Norwegian, Johan Nordahl Brun (1745-1816), was the principal tragedian of the time, in the French taste. It was a Norwegian, J. H. Wessel (1742-1785), who laughed this taste out of fashion. In 1772 the Norwegian poets were so strong in Copenhagen that they formed a Norske Selskab (Norwegian Society), which exercised a tyranny over contemporary letters which was only shaken when Baggesen appeared. Among the leading writers of this period are Claus Frimann (1746-1829), Peter Harboe Frimann (1752-1839), Claus Fasting (1746-1791), Johan Wibe (1748-1782), Edvard Storm (1749-1794), C. H. Pram (1756-1821), Jonas Rein (1760-1821), Jens Zetlitz (1761-1821), and Lyder Christian Sagen (1771-1850), all of whom, though Norwegians by birth, find their place in the annals of Danish literature. To these poets must be added the philosophers Niels Treschow (1751-1833) and Henrik Steffens (1773-1845), and in later times the poet Johannes Carsten Hauch (1790-1872). The first form which Norwegian literature took as an independent thing was what was called “Syttendemai-Poesi,” or The “Trefoil.” poetry of the 17th of May, that being the day on which Norway obtained her independence and proclaimed her king. Three poets, called the “Trefoil,” came forward as the inaugurators of Norwegian thought in 1814. Of these Conrad Nicolai Schwach (1793-1860) was the least remarkable. Henrik Anker Bjerregaard (1792-1842), born in the same hamlet of Ringsaker as Schwach, had a much brighter and more varied talent. His Miscellaneous Poems, collected at Christiania in 1829, contain some charming studies from nature, and admirable patriotic songs. He brought out a tragedy of Magnus Barfods Sönner (Magnus Barefoot's Sons) and a lyrical drama, Fjeldeventyret (The Adventure in the Mountains) (1828). He became judge of the supreme court of the diocese of Christiania. The third member of the Trefoil, Mauritz Kristoffer Hansen (1794-1842), was a schoolmaster. His novels, of which Ottar de Bretagne (1819) was the earliest, were much esteemed in their day, and after his death were collected and edited (8 vols., 1855-1858), with a memoir by Schwach. Hansen's Poems, printed at Christiania in 1816, were among the earliest publications of a liberated Norway, but were preceded by a volume of Smaadigte (Short Poems) by all three poets, edited by Schwach in 1815, as a semi-political manifesto. These writers, of no great genius in themselves, did much by their industry and patriotism to form a basis for Norwegian literature. The creator of Norwegian literature, however, was the poet Henrik Arnold Wergeland (1808-1845) (q.v. ), a man of great Wergeland, Welhaven. genius and enthusiasm, who contrived within the limits of a life as short as Byron's to concentrate the labours of a dozen ordinary men of letters. He held views in most respects similar to those pronounced by Rousseau and Shelley. His obscurity and extravagance stood in the way of his teaching, and his only disciples in poetry were Sylvester Sivertson (1809-1847), a journalist of talent whose verses were collected in 1848, and Christian Monsen (1815-1852). A far more wholesome and constructive influence was that of Johann Sebastian Cammermeyer Welhaven (1807-1873) (q.v. ), who was first brought to the surface by the conservative reaction in 1830 against the extravagance of the radical party. A savage attack on Henrik Wergeland's Poetry, published in 1832, caused a great sensation, and produced an angry pamphlet in reply from the father, Nikolai Wergeland. The controversy became the main topic of the day, and in 1834 Welhaven pushed it into a wider arena by the publication of his beautiful cycle of satirical sonnets called Norges Dæmring (The Dawn of Norway), in which he preached a full conservative gospel. He was assisted in his controversy with Wergeland by Henrik Hermann Foss (1790-1853), author of Tidsnornerne (The Norns of the Age) (1835) and other verses. however, better known by his labours in comparative mythology, in conjunction with P. C. Asbjörnsen (see Asbjörnsen and Moe). The political crisis of 1884-1885, which produced so remarkable an effect upon the material and social life of Norway, was not The new movement. without its influence upon literature. There had followed to the great generation of the 'sixties, led by Ibsen and Björnson, a race of entirely prosaic writers, of no great talent, much exercised with “problems.” The movement which began in 1885 brought back the fine masters of a previous imaginative age, silenced the problem-setters, and encouraged a whole generation of new men, realists of a healthier sort. In 1885 the field was still held by the three main names of modern Norse literature—Ibsen, Björnson and Lie. Henrik Ibsen proceeded deliberately with his labours, and his name at the same time grew in reputation and influence. The advance of Björnstjerne Björnson was not so regular, because it was disturbed by political issues. Moreover, his early peasant tales once more, after having suffered great neglect, grew to be a force, and Björnson's example has done much to revive an interest in the art of verse in Norway. Jonas Lie, the most popular novelist of Norway, continued to publish his pure, fresh and eminently characteristic stories. His style, colloquial almost to a fault, has neither the charm of Björnson nor the art of some of the latest generation. Ibsen, Björnson and Lie continued, however, to be the three representative authors of their country. Kristian Elster (1841-1881) showed great talent in his pessimistic novels Tora Trondal (1879) and Dangerous People (1881). Kristian Glöersen (b. 1838) had many affinities with Elster. Arne Garborg (1851) was brought up under sternly pietistic influences in a remote country parish, the child of peasant parents, in the south-west corner of Norway, and the gloom of these early surroundings has tinged all his writings. The early novels of Garborg were written in the peasant dialect, and for that reason, perhaps, attracted little attention. It was not until 1890 that he addressed the public in ordinary language, in his extraordinary novel, Tired Men, which produced a deep sensation. Subsequently Gargborg returned, with violence, to the cultivation of the peasant language, and took a foremost part in the maalstræv. A novelist of considerable crude force was Amalie Skram (1847-1905), wife of the Danish novelist, Erik Skram. Her novels are destitute of literary beauty, but excellent in their local colour, dealing with life in Bergen and the west coast. But the most extravagant product of the prosaic period was Hans Jæger (b. 1854), a sailor by profession, who left the sea, obtained some instruction and embarked on literature. Jæger accepted the naturalistic formulas wholesale, and outdid Zola himself in the harshness of his pictures of life. Several of Jæger's books, and in particular his novel Morbid Love (1893), were immediately suppressed, and can with great difficulty be referred to. Knud Hamsun (b. 1860) has been noted for his egotism, and for the bitterness of his attacks upon his fellow writers and the great names of literature. Hamsun is seen at his best in the powerful romance called Hunger (1888). A writer of a much more pleasing, and in its quiet way of a much more original order, is Hans Aanrud (b. 1863). His humour, applied to the observation of the Ostland peasants—Aanrud himself comes from the Gulbrandsdal—is exquisite; he is by far the most amusing of recent Norwegian writers, a race whose fault it is to take life too seriously. His story, How Our Lord made Hay at Asmund Bergemellum's (1887), is a little masterpiece. Peter Egge (b. 1869), a young novelist and playwright from Trondhjem, came to the front with careful studies of types of Norwegian temperament. In his Jacob and Christopher (1900) Egge also proved himself a successful writer of comedy. Gunnar Heiberg (b. 1857), although older than most of the young generation, has but lately come into prominence. His poetical drama, The Balcony, made a sensation in 1894, but ten years earlier his comedy of Aunt Ulrica should have awakened anticipation. His strongest work is Love's Tragedy (1904). Two young writers of great promise were removed in the very heyday of success, Gabriel Finne (1866-1899) and Sigbjörn Obstfelder (1866-1900). The last mentioned, in The Red Drops and The Cross, published in 1897, gave promise of something new in Norwegian literature. Obstfelder, who died in a hospital in Copenhagen in August 1900, left an important book in MS., A Priest's Diary (1901). Verse was banished from Norwegian literature, during the years that immediately preceded 1885. The credit of restoring it belongs to Sigurd Bödtker, who wrote an extremely naturalistic piece called Love, in the manner of Heine. The earliest real poet of the new generation is, however, Niels Collett Vogt (b. 1864), who published a little volume of Poems in 1887. Arne Dybfest (1868-1892), a young anarchist who committed suicide, was a decadent egotist of the most pronounced type, but a poet of unquestionable talent, and the writer of a remarkably melodious prose. In 1891 was printed in a magazine Vilhelm Krag's (b. 1871) very remarkable poem called Fandango, and shortly afterwards a collection of his lyrics. Vogt and V. Krag continued to be the leading lyrical writers of the period, and although they have many imitators, they cannot be said to have found any rivals. Vilhelm Krag turned to prose fiction, and his novels Isaac Seehuusen (1900) and Isaac Kapergast (1901) are excellent studies of Westland life. More distinguished as a novelist, however, is his brother, Thomas P. Krag (b. 1868), who published a series of romantic novels, of which Ada Wilde (1897) is the most powerful. His short stories are full of delicate charm. Hans E. Kinck (b. 1865) is an accomplished writer of short stories from peasant life, written in dialect. Bernt Lie (b. 1868) is the author of popular works of fiction, mainly for the young. Sven Nilssen (b. 1864) is the author of a very successful novel, The Barque Franciska (1901). With him may be mentioned the popular dramatist and memoir-writer, John Paulsen (b. 1851), author of The Widow's Son. Johan Bojer (b. 1872) has written satirical romances, of which the most powerful is The Power of Faith (1903). Jakob Hilditch (b. 1864) has written many stories and sketches of a purely national kind, and is the anonymous author of a most diverting parody of banal provincial journalism, Tranviksposten (1900-1901). The leading critics are Carl Nærup (b. 1864) and Hjalmar Christensen (b. 1869), each of whom has published collections of essays dealing with the aspects of recent Norwegian literature. The death of the leading bibliographer and lexicographer of Norway, Jens Braage Halvorsen (1845-1900), inflicted a blow upon the literary history of his country; his Dictionary of Norwegian Authors (1885-1900)—left for completion by Halfdan Koht—is one of the most elaborate works of its kind ever undertaken. Among recent historians of Norway much activity has been shown by Ernst Sars (b. 1835) and Yngvar Nielsen (b. 1843). The great historian of northern jurisprudence was L. M. B. Aubert (1838-1896), and in this connexion T. H. Aschehoug (b. 1822) must also be mentioned. The leading philosopher of Norway in those years was the Hegelian Marcus Jakob Monrad (b. 1816), whose Aesthetics of 1889 is his masterpiece. The close of 1899 and the beginning of 1900 were occupied by a discussion, in which every Norwegian author took part, The “maal” controversy. as to the adoption of the landsmaal, or composite dialect of the peasants, in place of the rigsmaal or Dano-Norwegian. Political prejudice greatly embittered the controversy, but the proposition that the landsmaal, which dates from the exertions of Ivar Aasen (q.v.) in 1850, should oust the language in which all the classics of Norway are written, was opposed by almost every philologist and writer in the country, particularly by Björnson and Sophus Bugge (b. 1833). On the other side, Arne Garborg's was almost the only name which carried any literary weight. The maal has no doubt enriched the literary tongue of the country with many valuable words and turns of expression, but there the advantage of it ends, and it is difficult to feel the slightest sympathy with a movement in favour of suppressing the language in which every one has hitherto expressed himself, in order to adopt an artificial dialect which exists mainly on paper, and which is not the natural speech of any one body of persons throughout the whole of Norway. ↑ In Norwegian the definite article (when there is no epithet) is added as a suffix to the substantive (masc. and fem. en, neuter et). Geographical terms are similarly suffixed to names, thus Suldalsvandet, the lake Suldal. The commonest geographical terms are: elv, river; vand, lake; fjeld, mountain or highland; ö, island; dal, valley; næs, cape; fos, waterfall; bræ, glacier; vik, vig, bay; eide, isthmus; fjord. Aa is pronounced aw. ↑ The middle and upper parts of many yalleys in Norway are known by different names from those of the rivers which water them, and such names may extend in common usage over the district on either side of the valley. ↑ In 1810 he was elected heir to the Swedish throne, in succession to the childless king Carl XIII., who died in 1818. This page was last edited on 4 November 2015, at 11:13.